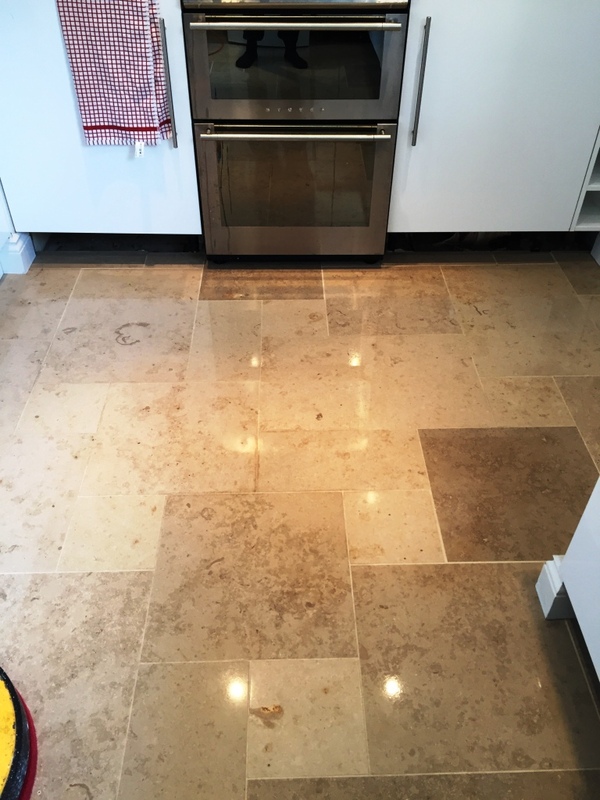 This client from Cobham had her kitchen and diner tiled with Travertine six years ago. With two children and three dogs living there, the sealer has gradually worn away leaving the stone exposed to dirt. The leafy village of Cobham lies in the borough of Elmbridge which is noted as being a one of the most desirable places to live in the UK. As a result, it attracts a lot of investment in property including expensive tiled floors. I went over to survey the floor and discussed with the client how we could improve the floors appearance. 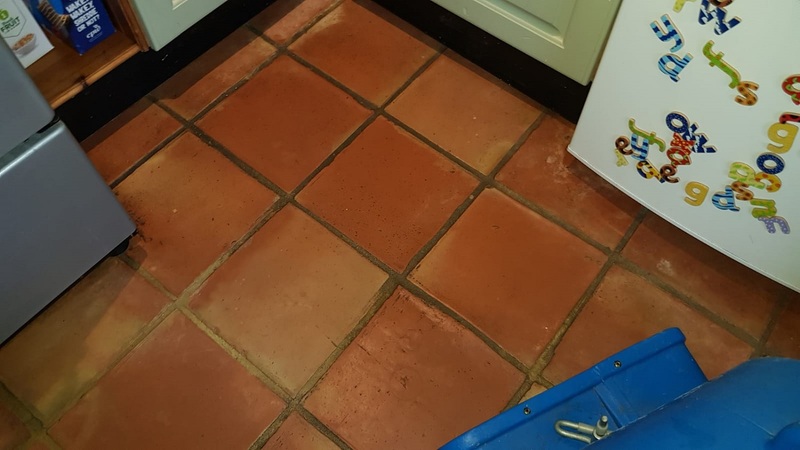 The solution I proposed was to deep clean the tiles to extract all the dirt and remove what was left of the old sealer and then to re-seal the floor in order to protect it going forward. 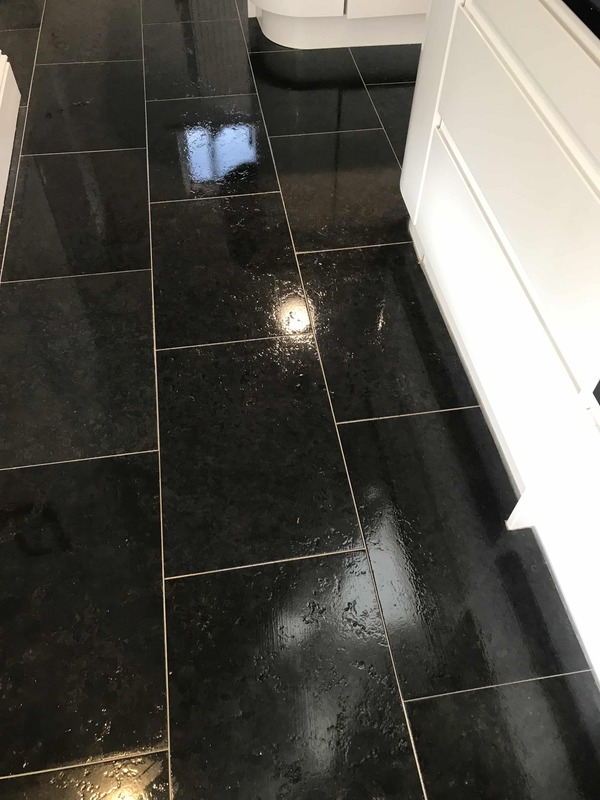 This process typically takes two days to complete; day one is spent cleaning the stone and grout, including the removal of the existing sealer and day two is spent sealing and polishing. The client was satisfied with the quotation and we arranged a time to come back and carry out the work. Firstly, I asked the client to clear the floor and to help me put the dining table in the garden out of the way. Then using Tile Doctor Pro-Clean and a wire brush I cleaned the grout in the kitchen, diner and utility room. 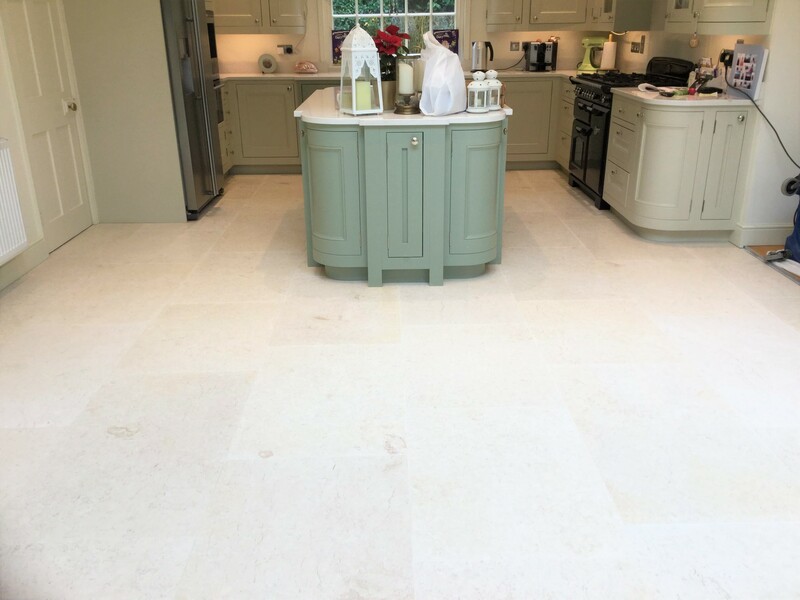 It was a large installation of Travertine, so this task took some time to complete. The floor was rinsed, and all the dirt produced was removed with a wet vacuum cleaner. The next job was to remove what remained of the previous sealer and top layer of dirt. This was done with a rotating buffing machine with a set of diamond encrusted burnishing pads. The first one applied is a coarse 400-grit pad followed by 800 and 1500-grit, working through the pads in sequence. You might be familiar with the grit system from sandpaper, rough down to smooth. The process is lubricated with water and the slurry generated is rinsed off with water and extracted using a wet vacuum. I left the floor to dry off overnight, they can walk on it during this time, but they needed to be careful of any spillages. The dogs were also welcomed back in from the front room. The second day started with and inspection of the Travertine tile and grout looking for any areas that need further attention. I was satisfied that the floor was looking its’ best and once the preparation was complete, I applied the first coat of sealer. 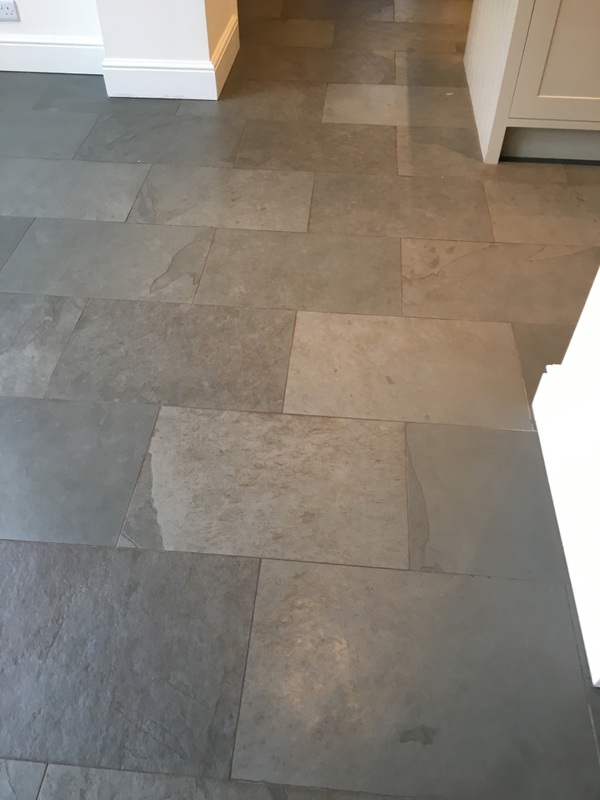 On this occasion I went with Tile Doctor Ultra Seal which is doesn’t change the look of the stone giving a completely natural look. This product soaks into the pores of the stone protecting if from within and should last between three and five years depending on the amount of wear it received and how the floor is cleaned and maintained. Two coats of sealer were applied and after each coat dried, I polished the floor using a very fine 3000-grit diamond pad. 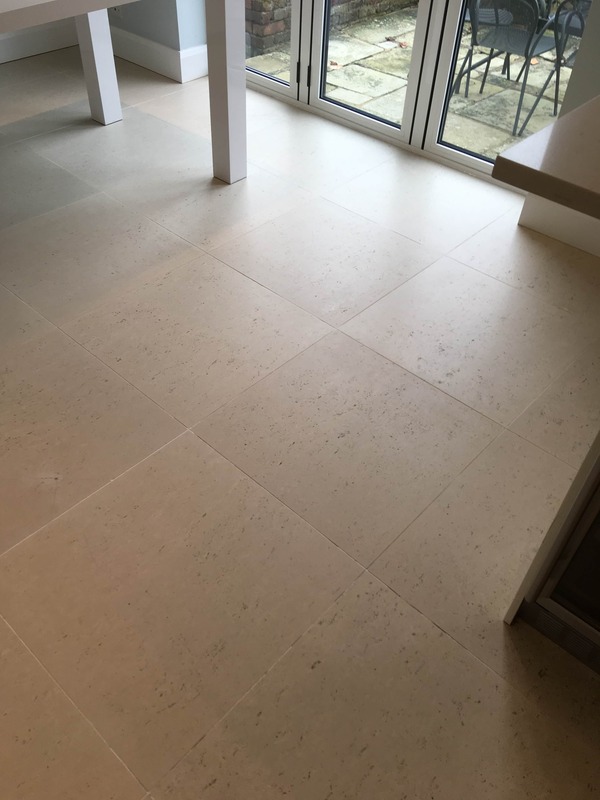 The pad is run across the Travertine dry with only a little water sprayed onto the tile using a process we call a ‘Spray Burnish’. I asked the client to keep off the travertine until it’s cured, usually for a couple of hours which is always a good excuse to go out for the evening! The client was very happy the floor and they remarked it looked as good as when it was first laid. 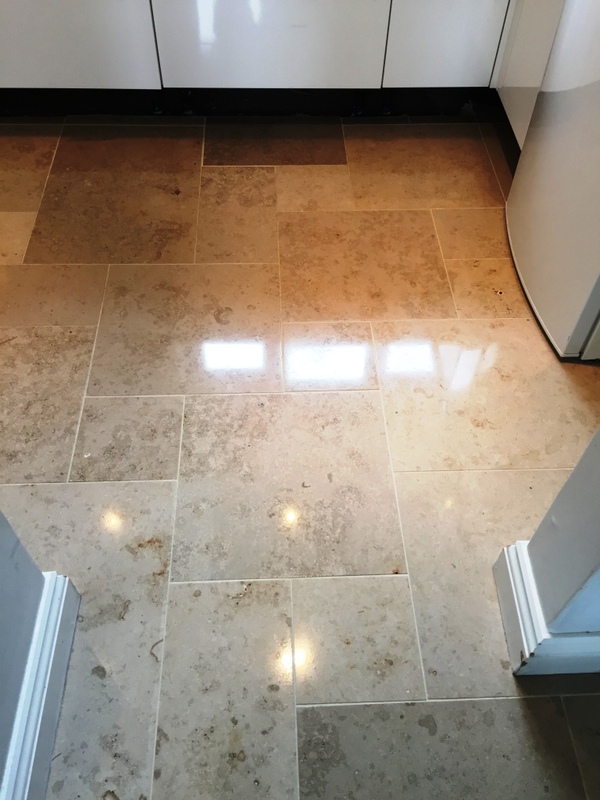 For aftercare I recommended using Tile Doctor Stone Soap which is ideal for the regular cleaning of sealed natural stone floors, many supermarket products are simply too harsh and will reduce the life of the sealer. 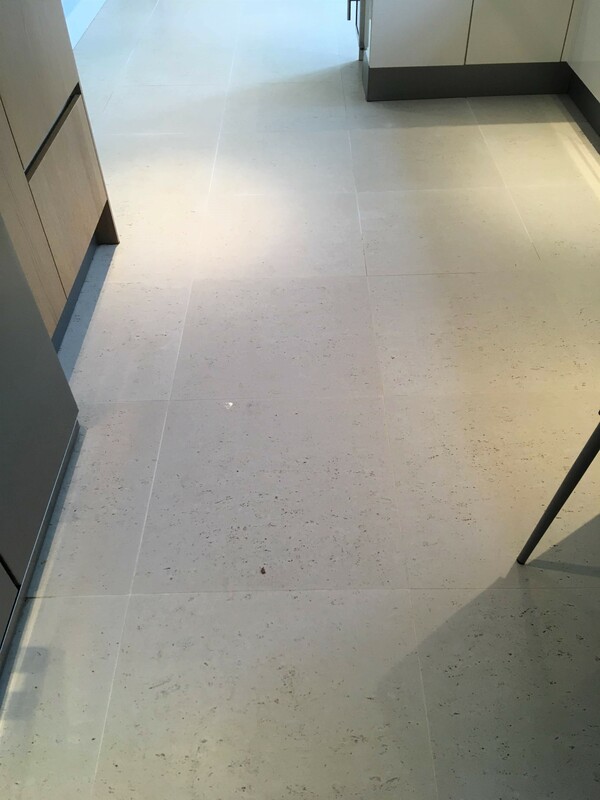 The owner of this Porcelain tiled Kitchen floor in Twickenham was struggling to keep it clean and it was now in need of a deep clean. Twickenham famous for being the home of Rugby Union is only 9 miles away from my base in Shepperton, so it wasn’t long before I was able to pop over and survey the floor. 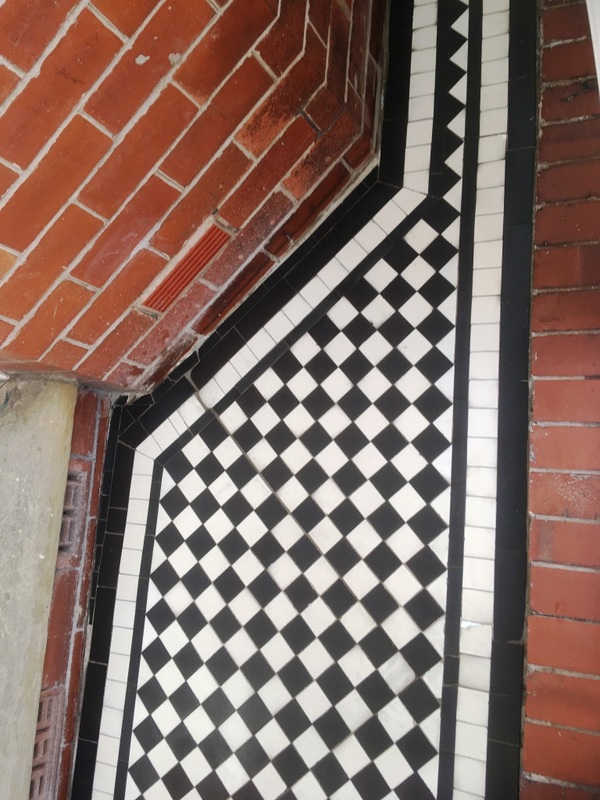 The tiles were a little grubby, but it was the grout that was most affected; its hard to believe but the now black grout was originally cream in colour and chosen to match to tile. Having visited the client, we discussed what needed to be done to get the floor looking back up to scratch and looking clean again. We agreed a price for the work to be carried out the following week. Although this wasn’t the case its worth knowing that some types of Porcelain tile on the market today are Micro-Porous and contain small holes in the tile. 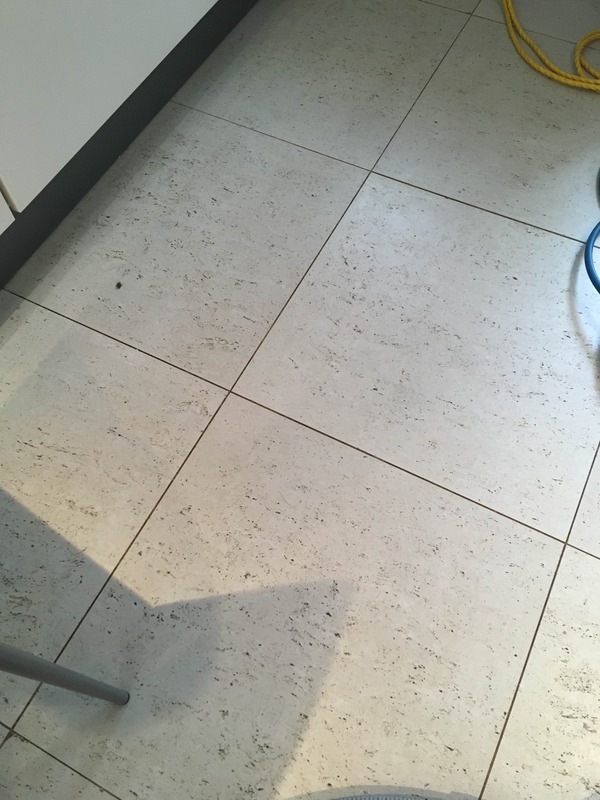 These tiles need to be sealed to prevent dirt becoming ingrained as this can be very difficult to remove with a mop. Incidentally on the topic of mops I have noticed clients tend to rinse their mop in the same bucket containing the detergent. This results in the detergent being contaminated with dirt and being put back on the floor. If you are going to use this method to clean your floor it is best to have two buckets, one containing your detergent and the second where you rinse your mop. To get the tiles clean I used a heavy-duty rotary buffer fitted with a black scrubbing pad and ran that over the floor along with a medium dilution of Tile Doctor Pro-Clean. Tile Doctor Pro-Clean is a versatile tile and grout cleaning product designed for this purpose, so it wasn’t long before the solution went dark as the dirt was released from the tile. The now soiled cleaning solution was then extracted from the tiles using a wet vacuum. 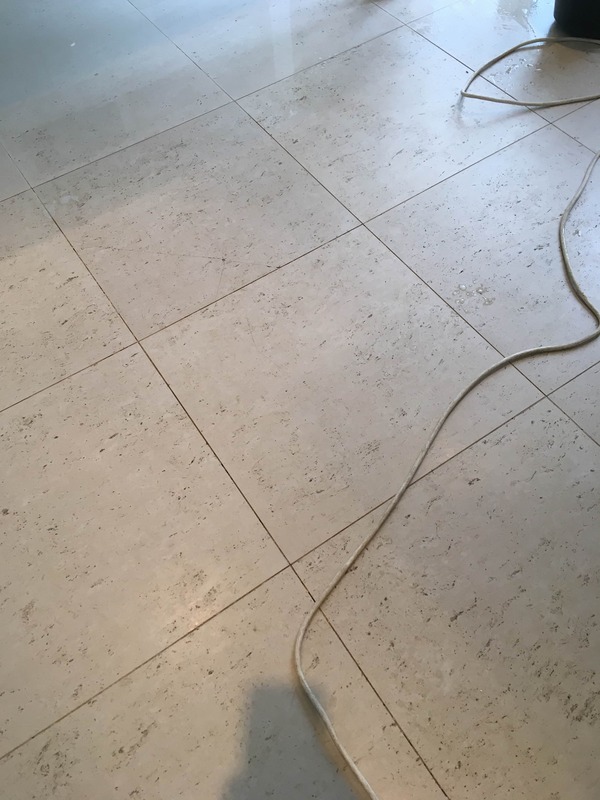 To get the grout lines really clean they had to be hand scrubbed using more Tile Doctor Pro-Clean and a hand-held scrubbing brush. 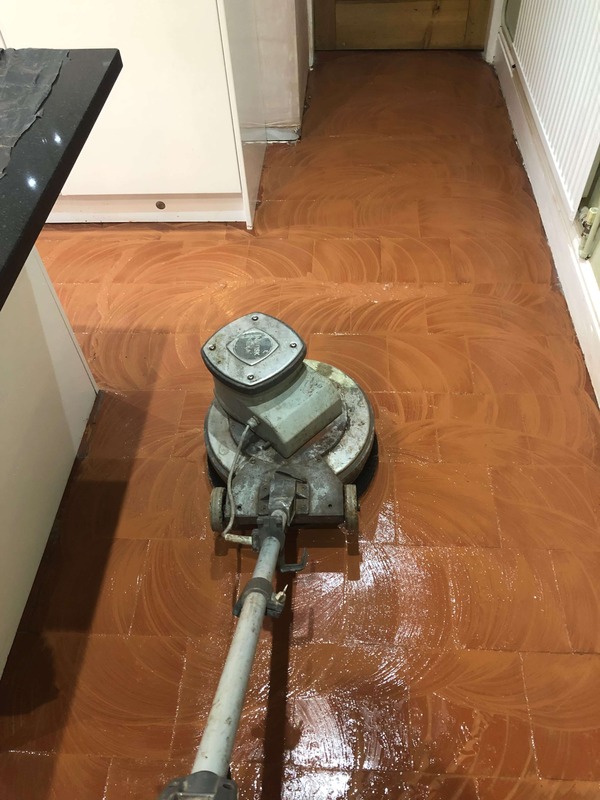 The rotary pads struggle to get into the recesses of the grout lines, so this really is the best method and I find you get a better finish with this extra effort. After sufficient scrubbing, we were satisfied that all of the soil was broken up, we then machine flushed and vacuumed the cleaning product and dirt away from the floor. As these tiles are factory sealed there is no need to apply a sealant. 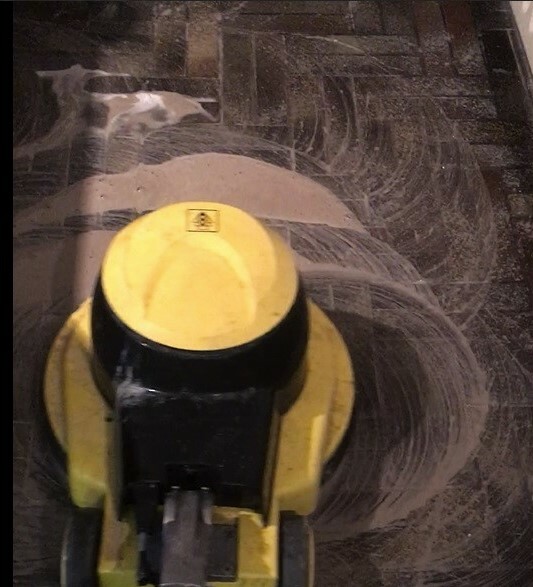 One hour later, the floor was ready to be used again. 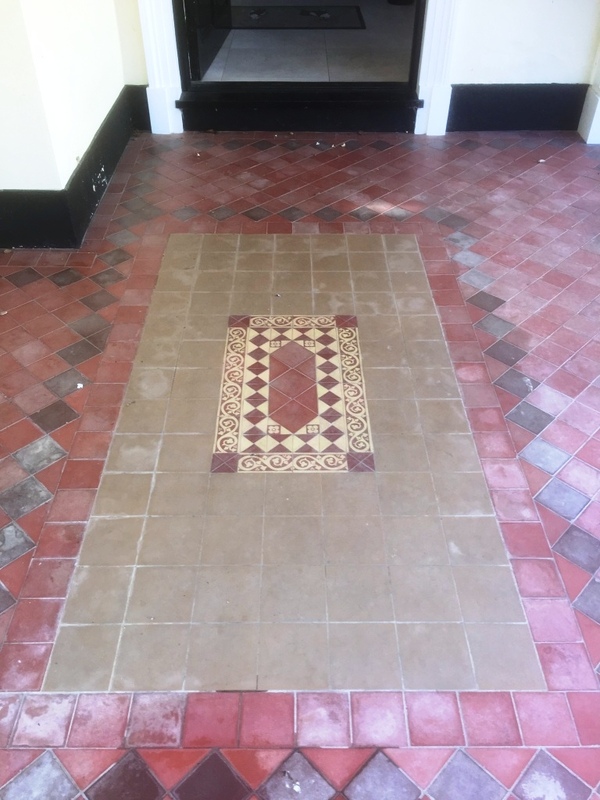 The photograph below is of a Large Quarry Tiled porch laid out with a classic Victorian pattern inlay at a house I worked on recently in Sutton Courtenay, Oxfordshire. Sutton Courtenay is a pretty village of on the River Thames to the south of Abingdon and to the northwest of Didcot. Historically it was previously part of Berkshire, but it has been administered as part of Oxfordshire since 1974 when the boundaries changed. 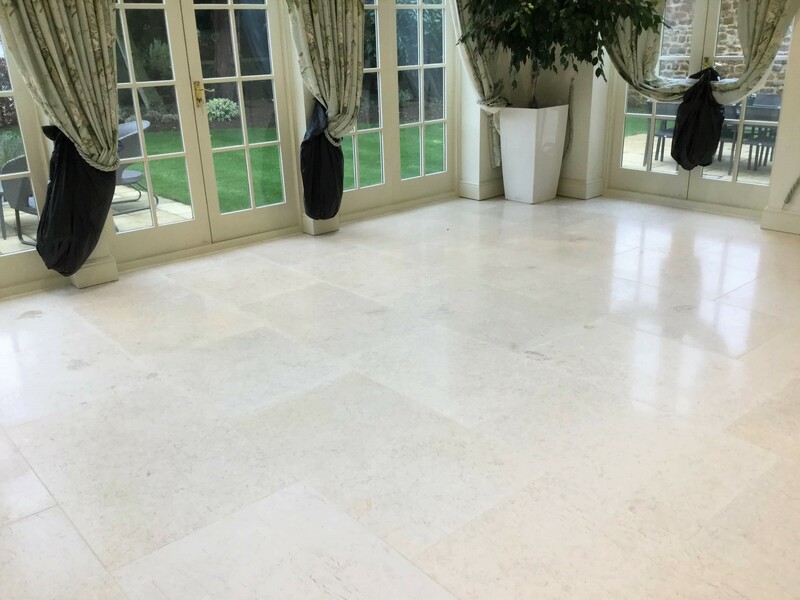 The client was unhappy with the floor, it looked very tired, it had lost all its’ sheen and was covered in large areas of dirty white marks. 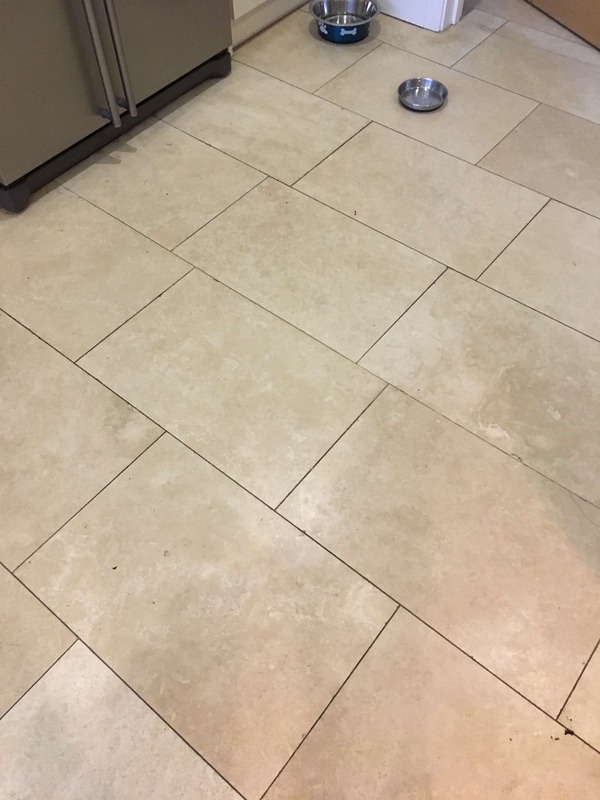 I discussed with the client what Tile Doctor could do to improve the floor and showed them an example of the cleaning process I would use on part of the floor. They were very happy with the test patch and could see that we could vastly improve the look of the floor. We agreed a price for the work and scheduled in some time in the diary to complete the work for them. 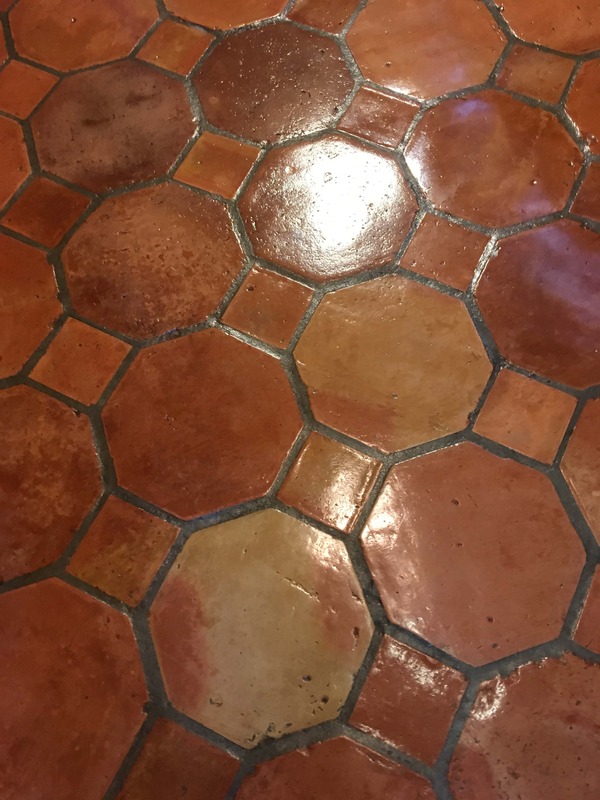 First, I cleaned the floor with a weak dilution of Tile Doctor Pro-Clean which is a highly concentrated, multi-purpose alkaline Tile cleaner, stripper and degreaser. It is a very effective cleaner that removes grease from areas that have been neglected or subjected to heavy use. I scrubbed the product into the floor with a rotary floor scrubber fitted with a soft brush, I then rinsed with cold water and vacuumed up the slurry produced with the wet vacuum. I then gave the tiles an acid wash using Tile Doctor Acid Gel scrubbed in this time with a black pad, then rinsed with a small amount of water and vacuumed again. 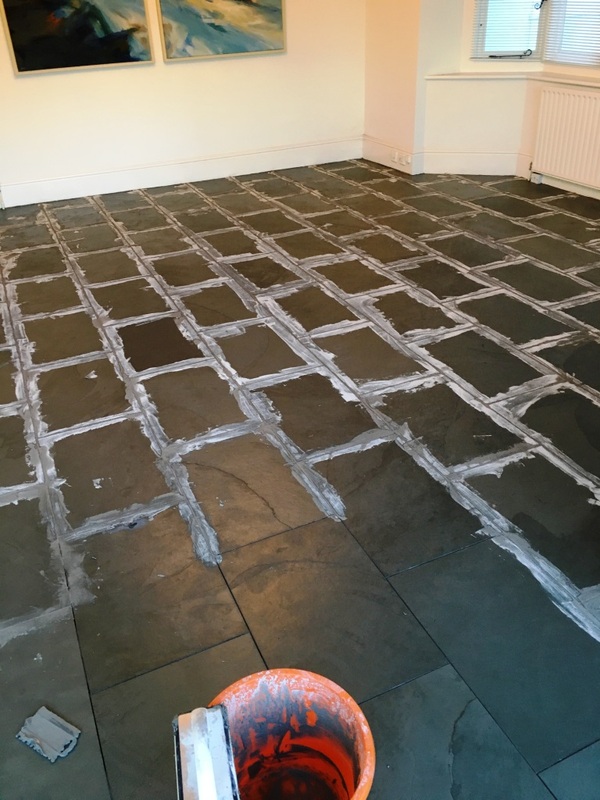 This process is designed to counter any alkaline salts known as efflorescence, that may be present in the tiles which is quite a common problem on old floors like this where no damp proof membrane exists under the floor. This action deal with the appearance of white salt staining as moisture rises through the tiles from the subfloor. I then left the floor to dry which only took a few hours due to the location of the tiles and the usually warm and windy for the time of year. Returning in the afternoon, I checked the floor was dry with my moisture meter and I was satisfied the floor was ready to be sealed. I chose to seal the floor with Tile Doctor Colour Grow which is an impregnating colour enhancing sealer which will protect the floor from staining from within by occupying the pores in the tile. Critically this sealer is also fully breathable thereby allowing moisture to pass through the tiles and not become trapped under the floor where it could spread to the walls leading to rising damp. I applied two coats initially and then after an hour, I applied a third coat. The floor was then buffed with a white pad to remove any excess and buff up the appearance of the tiles. 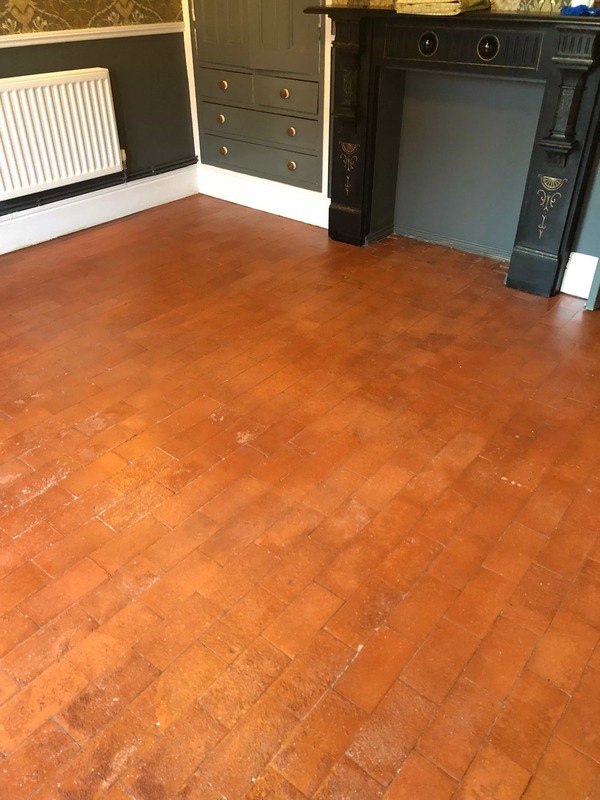 The floor looked superb and the client was very happy with the finish, the vibrancy of the colours in the tiles which were enhanced by the sealer was now very intense and the floor looked as it should. 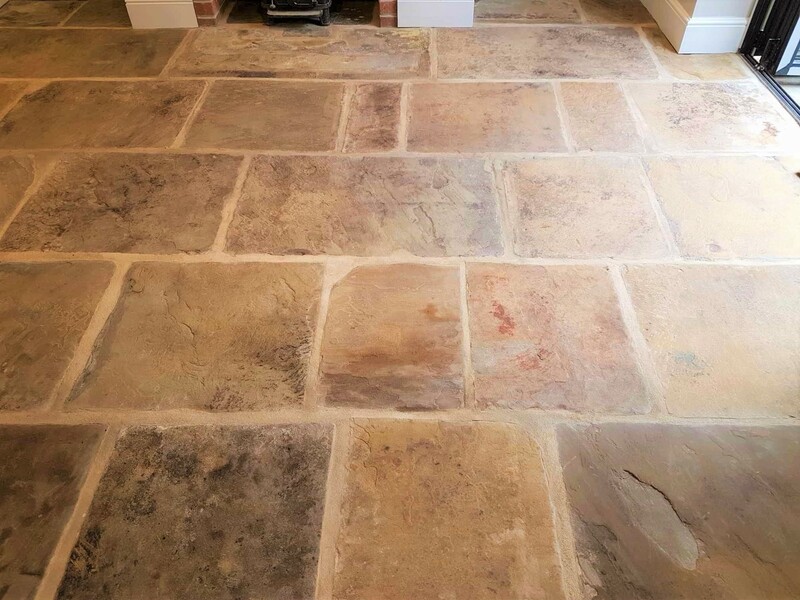 This is a reclaimedYorkshire flagstone floor that was re-laid at a house in Harrogate some years prior with under floor heating. The Yorkshire stone was really nice and contained some varied natural colours including green from what must have been a copper deposit in the stone. This is the beauty of this type of stone, there is a huge variation in tone and colour. 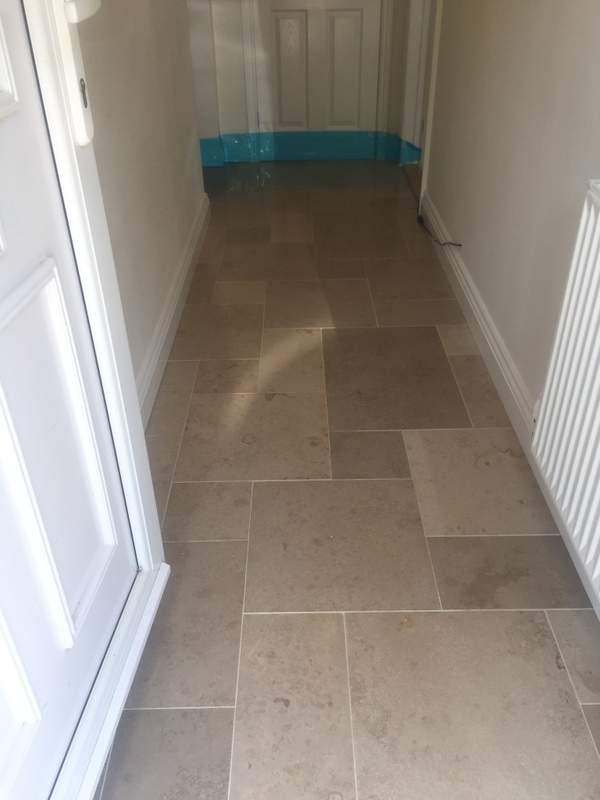 The client got in touch with Tile Doctor as the stone looking flat and featureless and had become difficult to keep clean. It was clear to me that the original sealer had all but worn off leaving the floor vulnerable to dirt, there were also some paint splashes from decorating that needed removing and some old tar spots that must have been there some time. The lovely property was in a quiet road near the centre of Harrogate which is a popular tourist spot close to the picturesque Yorkshire Dales. 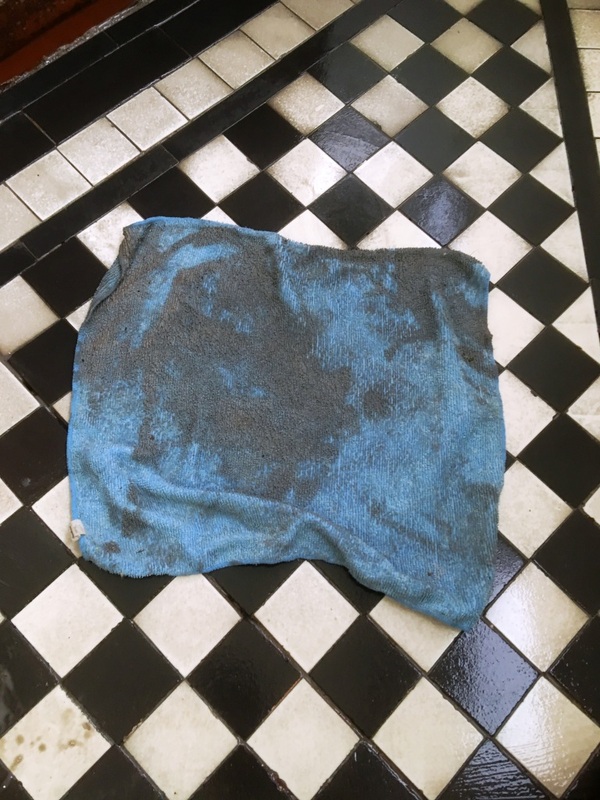 I gave the floor a thorough clean using a strong dilution of Tile Doctor Pro-Clean which was left to soak in for ten minutes before being scrubbed in with a black scrubbing pad fitted to a rotary machine. This process also softened the paint splashes and tar spots which I was able to carefully scrape off. The soiled cleaning solution was rinsed off the floor using water and then extracted with a wet vacuum. 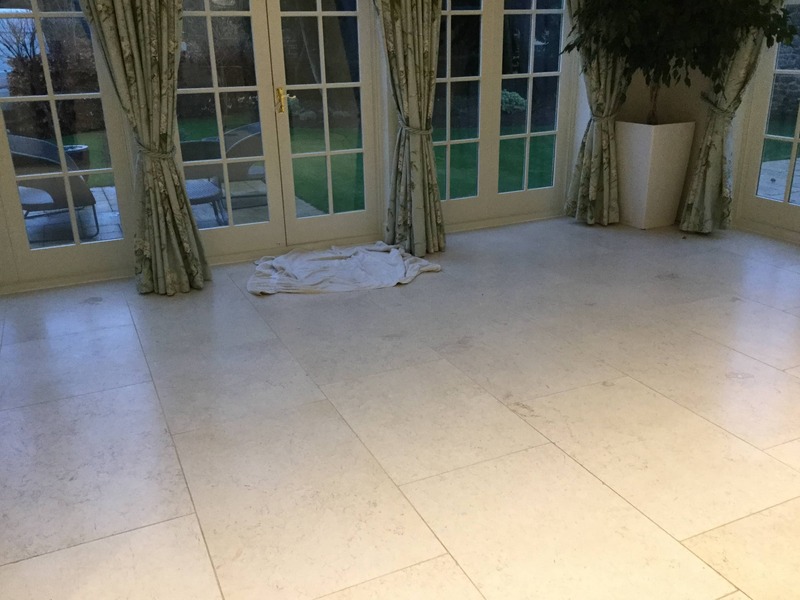 Once the floor was clear it was then inspected, and stubborn areas re-treated using the same process until I was happy the floor was as clean as it could be and that any trace of old sealer had been removed. 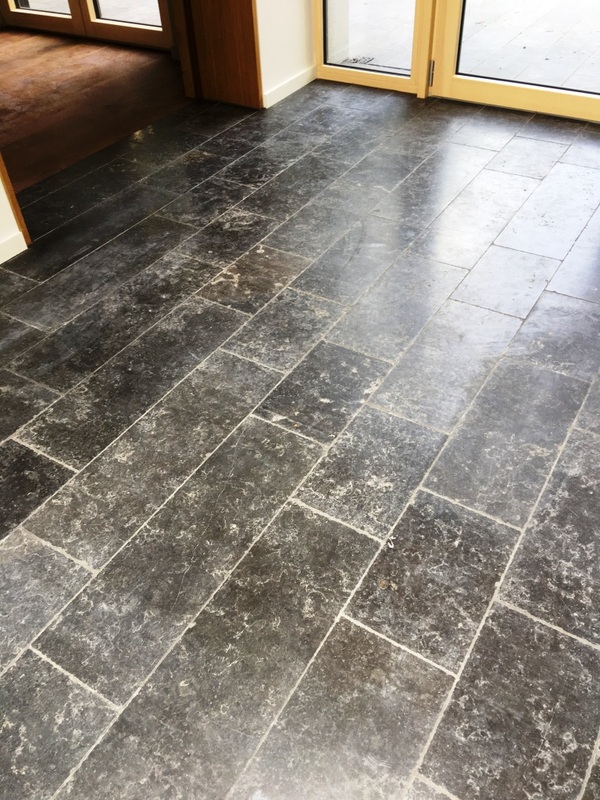 It’s important to ensure the floor is clear of old sealers before resealing as otherwise you end up with different layers of sealer on the floor. Also, if you don’t know what was applied previously you cannot guarantee that the new sealer will work with it, so it is best to start with a totally clean base. Before leaving for the night I gave the floor a thorough rinse with water to remove any trace of cleaning product and then extracted as much moisture as possible with the wet vacuum. Additionally, I asked the owner of the property to leave the underfloor heating on overnight to aid the drying process. We cannot seal the floor if it is not completely dry. The customer wanted a matt finish so when I came back the next day to seal the floor, I used two coats of Tile Doctor Ultra Seal. 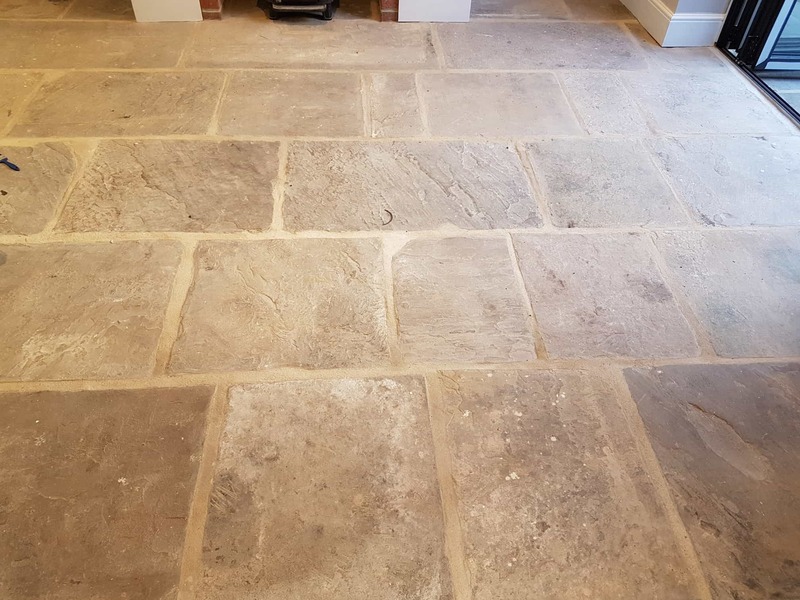 This is a natural look sealer that protects the stone from within but without altering its appearance, this works well if you’re looking to keep the floor appearance as light as possible. The deep cleaning and fresh sealer transformed the stone giving it a subtle contrast that brought out the unique colours in the stone including the green of the copper. 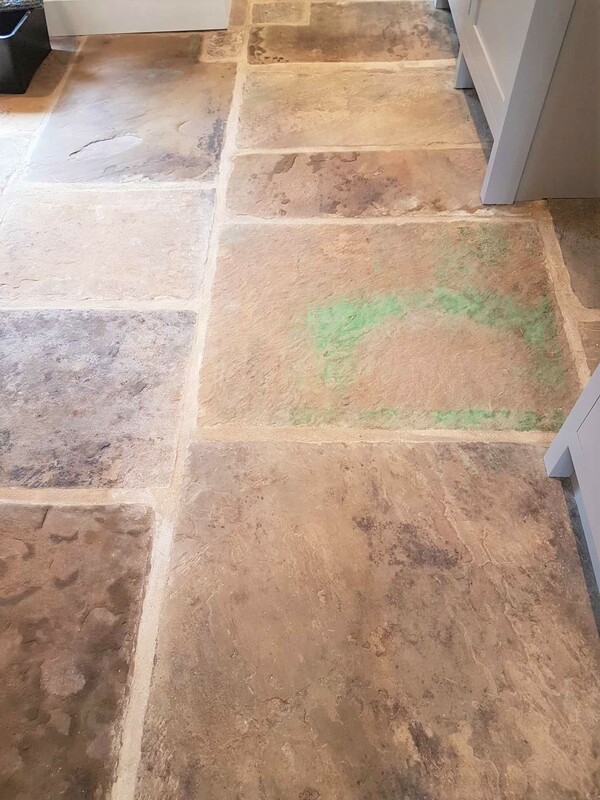 The client was very satisfied with the overall finish of the floor, the natural beauty of the Yorkshire Flagstone had been restored and now they would be able to maintain the floor keeping it looking lovely for longer. I suggested they use the Tile Doctor Neutral Cleaner for ongoing maintenance. This is a nice natural product specifically formulated for this type of floor. 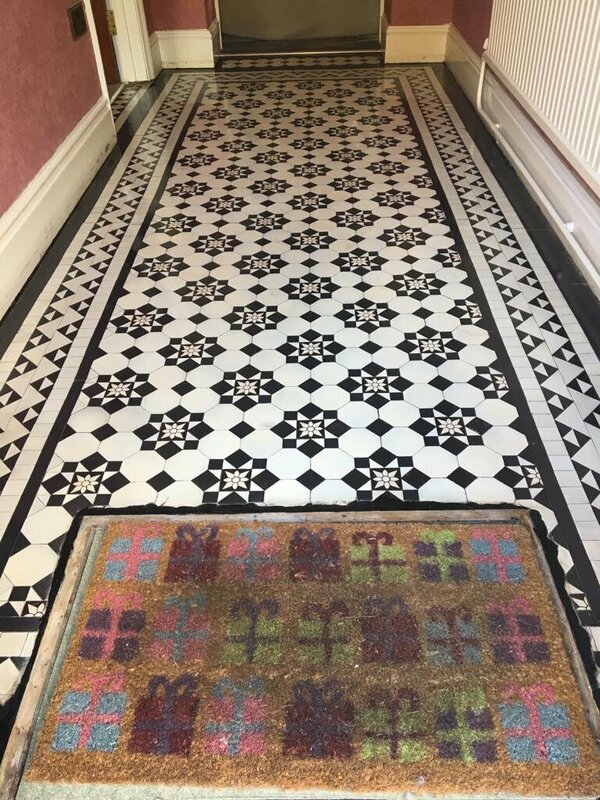 I was contacted by a professional couple who were despairing over the state of their Victorian tiled hallway floor which was dull and uninviting. The property was in Newport which is on the south east side of Wales around twelve miles east of the bustling city of Cardiff. I went over to visit the property which was a beautiful Victorian period terrace house nestled amongst other properties of a similar age properties. 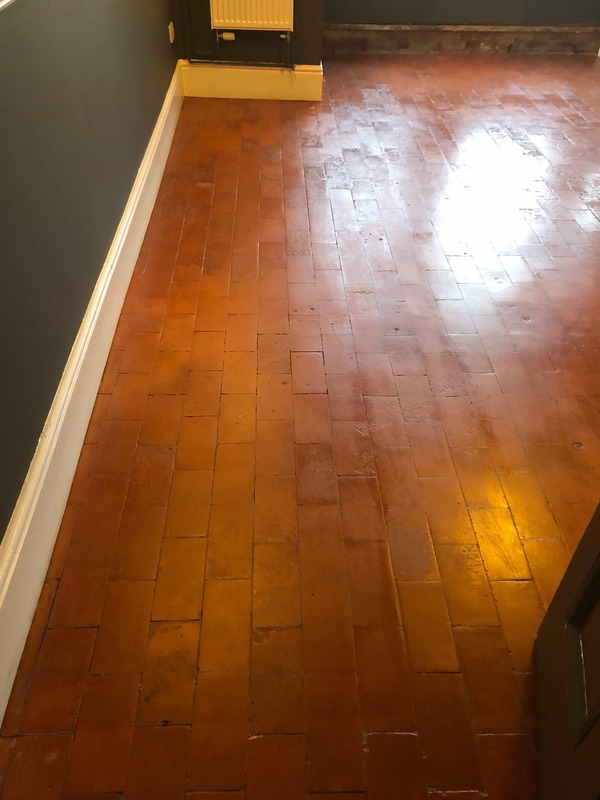 The couple wanted their Victorian hallway floor to be brought back to life, so I demonstrated the cleaning process I intended to use on a small part of the floor. Immediately it had the desired effect and the floor looked much cleaner. I could see that there were no structural issues with the floor and the test clean proved it was just ingrained dirt that was the problem. The clients were happy with the result of the demonstration and subsequent quote, so we arranged a suitable date to come back and complete the work. When I arrived, I started by protecting the skirting boards with tape and then set about giving the Victorian tiles a deep clean. 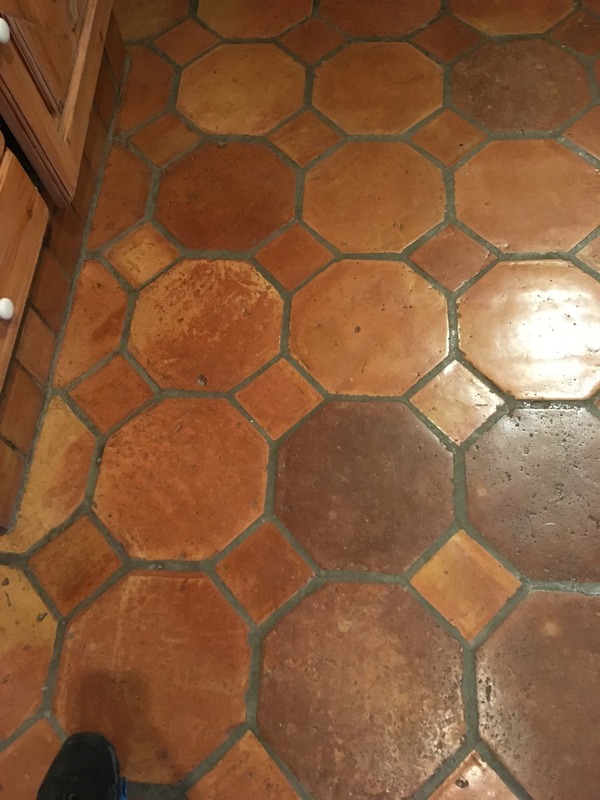 I applied a combination of Tile Doctor Pro-Clean and Remove and Go leaving it to dwell for a short time to allow the products to soak into the pores of the tiles and start breaking down the ingrained dirt. After about ten minutes I scrubbed the floor with black scrubbing pad attached to a rotary floor buffer which released the years of grime and dirt. The floor was then rinsed with water and the soil removed using a wet vacuum. I repeated the process to ensure the floor was as clean as possible. 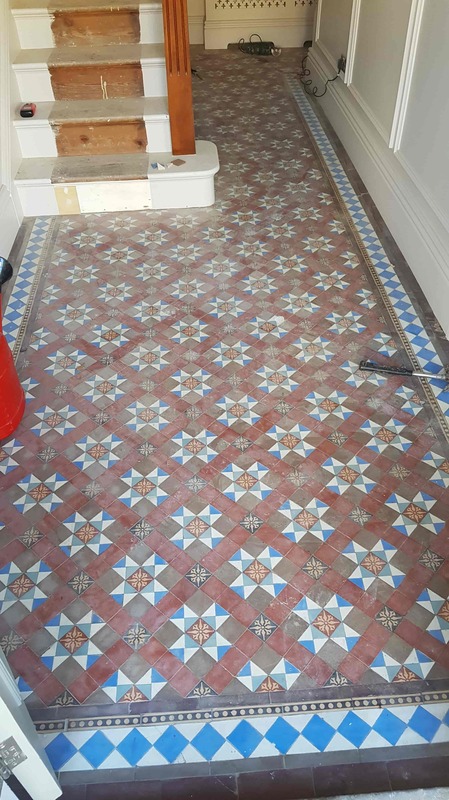 A further inspection of the Victorian tiles revealed a few stubborn marks which were dealt with using handheld diamond burnishing blocks. These are also handy for getting into the corners of the floor which were difficult to reach with the rotary machine. The floor was then left overnight to dry out. The following day I returned, and I checked the floor was dry using a moisture meter to ensure it was dry. 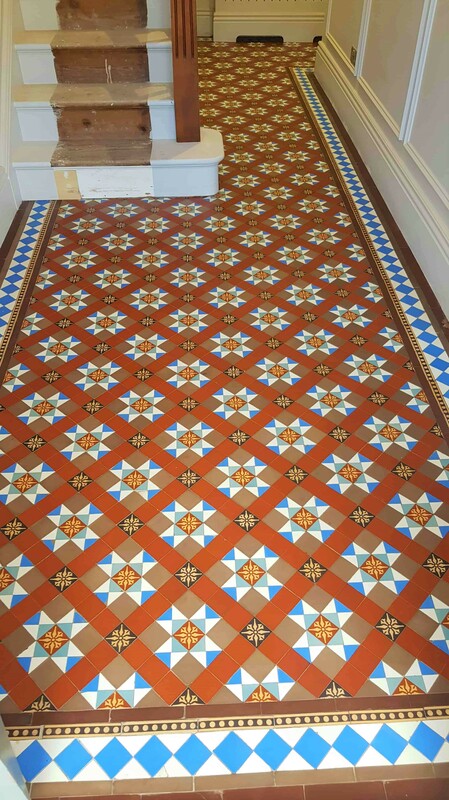 Once I was happy, I started to seal the floor with Tile Doctor Seal & Go which is a water-based sealer that works well on Victorian tiles. Several coats were applied building up layers to produce a stunning satin finish. Once I had finished the floor was looking so much cleaner and brighter and the addition of the sealer will protect the floor from dirt and keep it looking good for some time to come. 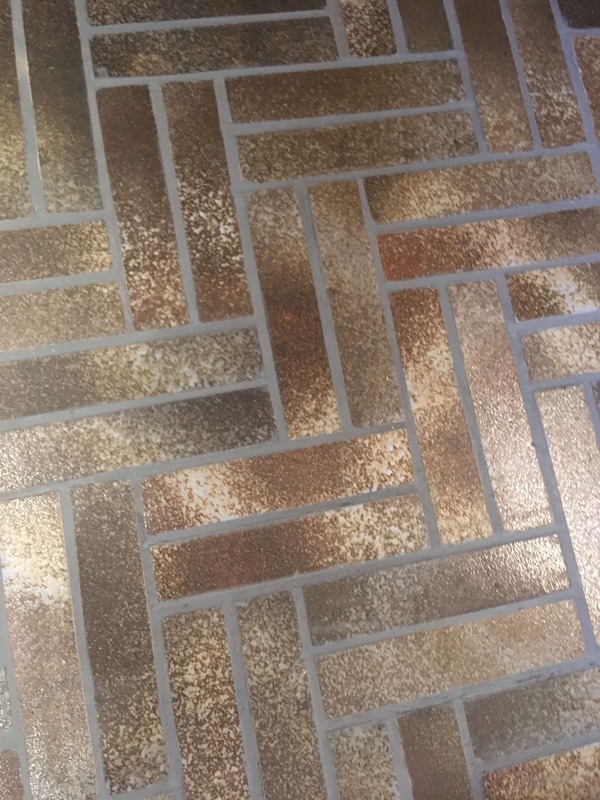 My clients were over the moon with the floor! 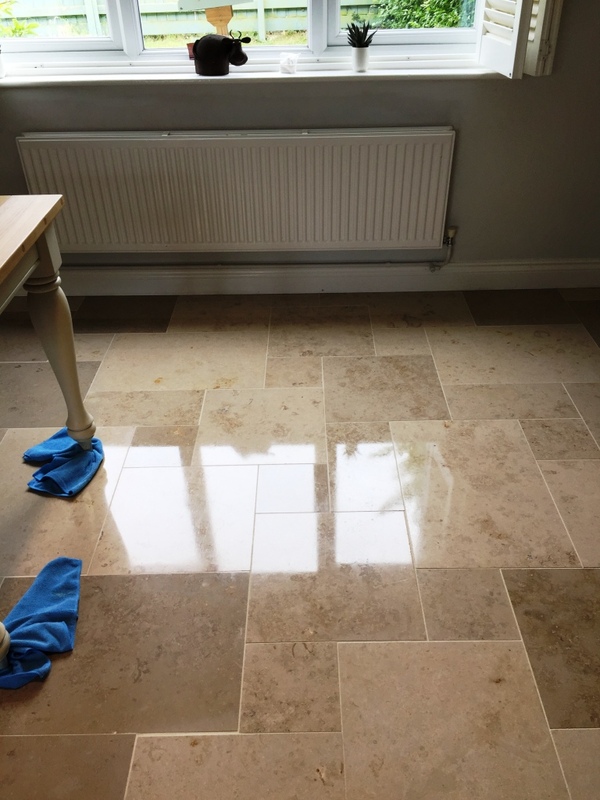 For aftercare I recommend Tile Doctor Neutral Tile Cleaner, which unlike the stronger products you find in supermarkets is ideal for cleaning sealed floors and will ensure the sealer stays in good condition. 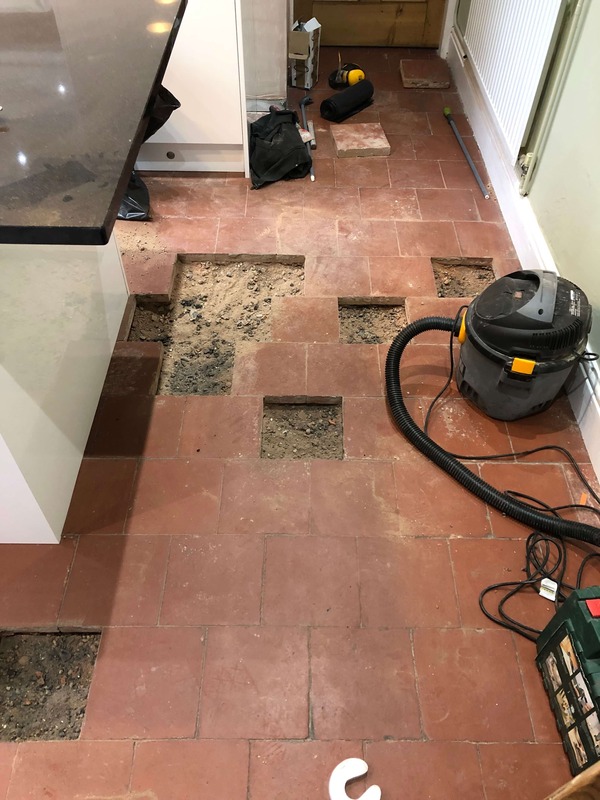 The third week was reserved for Sealing the tiles however this dragged on due to issues with the heating which was basically non-existent at the time and not an ideal situation in January. Persimmon went out of the way to chase up the plumbers who had been running behind and got this sorted for us, without heat we would struggle to get the sealer to dry. Our client contacted us after they moved into a house built circa early 1900 with many Victorian era features. 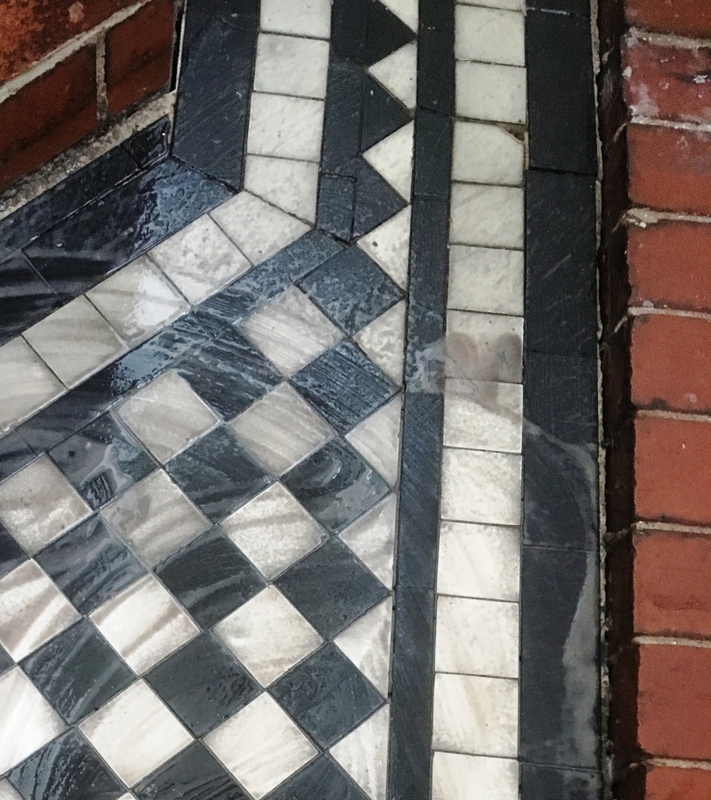 One of them was lovely tiled floor in their porch which consisted of a chequered pattern of Black and White Marble tiles. The white tiles were especially grubby and in need of a deep clean. 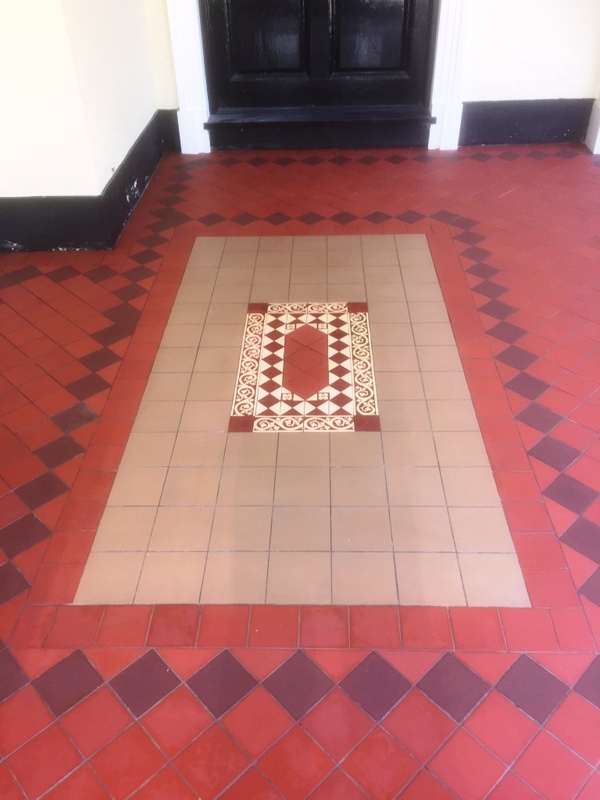 Being a fan of period features they were keen to see if the tiles could be renovated back to their former glory. The property was in Oldham, which is approximately 7 miles to the north east of Manchester near to Rochdale and well known for its history in the textile industry. We conducted a test on the tiles which worked well, and we were confident the whole floor could be significantly improved. The client was satisfied, we agreed a price and the job was booked in. Initially, to clean the floor we used Tile Doctor Remove and Go which was applied to the floor and left to soak into the tile and soften the dirt. This was followed up by scrubbing the product into the floor with a coarse black pad fitted to a rotary machine. The machine scrubbing really gets into the dirty areas and the grout lines. 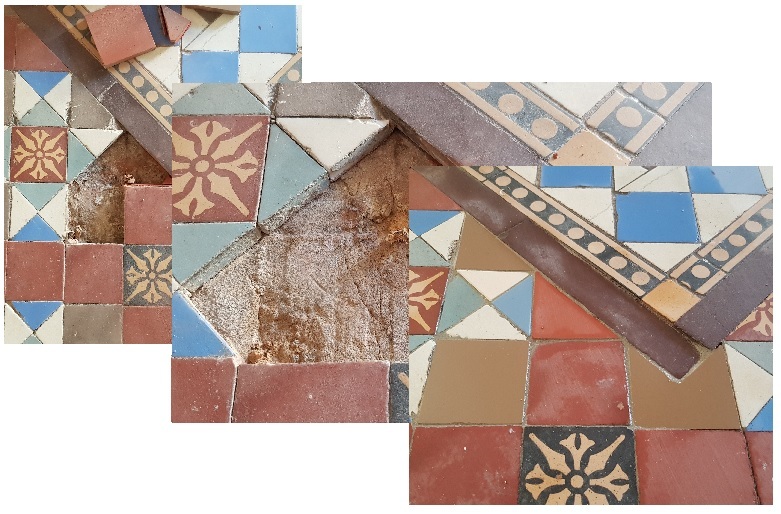 During the work we discovered that two of the tiles were loose, so they had to be removed, cleaned up and then re-secured using a flexible tile adhesive. 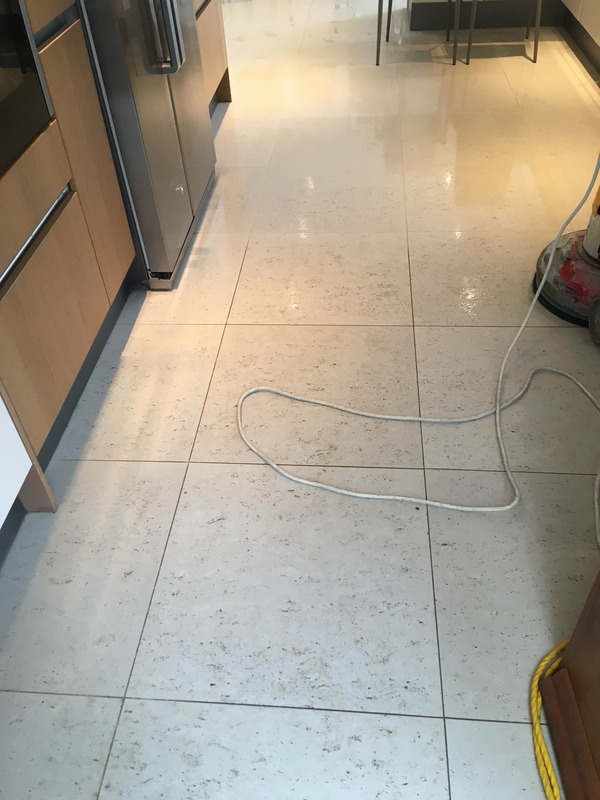 Being Tile Doctors, we are trained in all thing tile and so unlike regular cleaning businesses we are happy to carry out repairs along side the cleaning process. It also means we have a deeper understanding of the materials we are working with which enables us to complete the job to the highest standard. We left site for a short while and then returned to carry out the sealing process which would protect them from dirt and stains going forward. It was a relatively small area and so it wasn’t long before the tiles were dry, and the new adhesive had set. 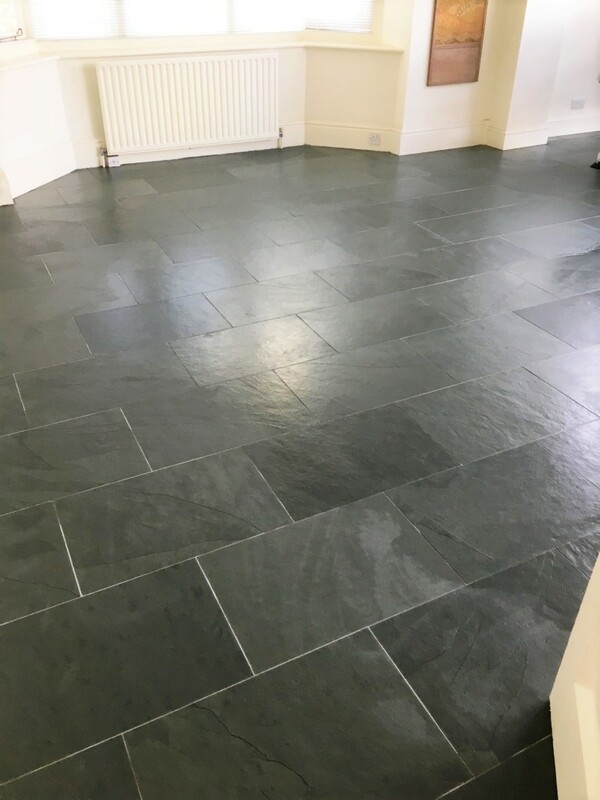 The floor was sealed with two coats of Tile Doctor Colour Grow, which is an impregnating breathable sealer that will cope will with the damp environment and the elements that the floor would be subjected to in an external location. This product also enhances the black and white contrast in the tiles improving the overall look of the floor. I think you will agree the pictures speak for themselves. It is lovely when you can get an old floor back to looking how it was when it was laid originally. The customer was astonished with the result and left the comment below. 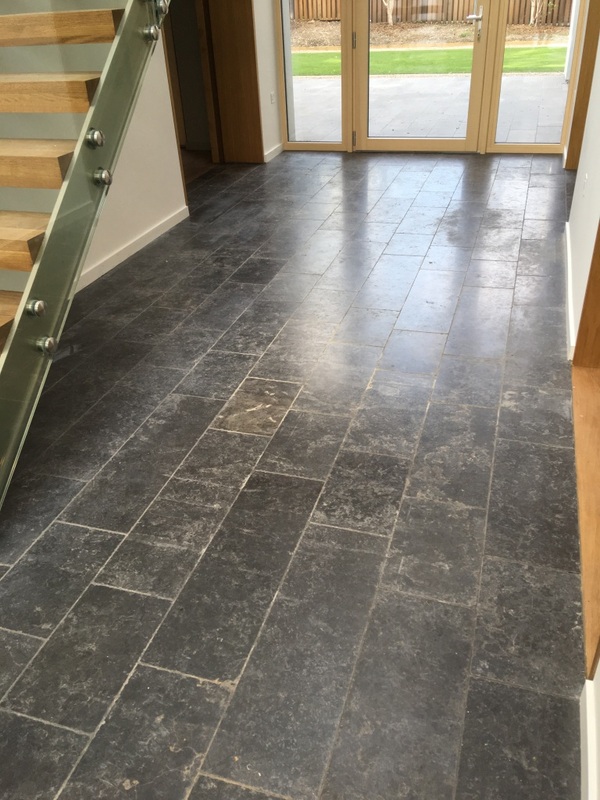 This was a very large natural Slate floor installed throughout much of the ground floor at a property in the East Surrey town of Oxted. 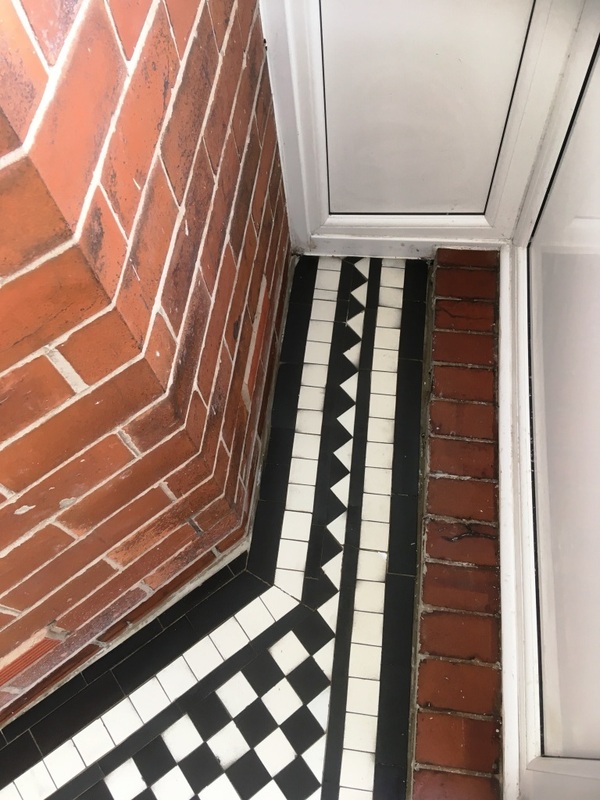 The owner was unhappy with the state of the tiles and especially the grout, however she wanted to ensure I would take maximum care around her Baby Grand Piano. If you have read any of my previous articles you will know I am careful and take time to protect anything that could be stained or damaged with a non-marking film. I therefore assured her I would take maximum care in her home and that it wouldn’t be a problem. I surveyed the floor and could see that the previous sealer had long since failed and dirt had penetrated the pores of the stone. This made it difficult to clean the floor effectively and resulted in a continually dull appearance. The grout had also trapped the dirt and had gone black as a result. The cure would be to strip the tile and grout of what was left of the original sealer, deep clean and then reseal. Happy with my quote we set a date for the work to start. 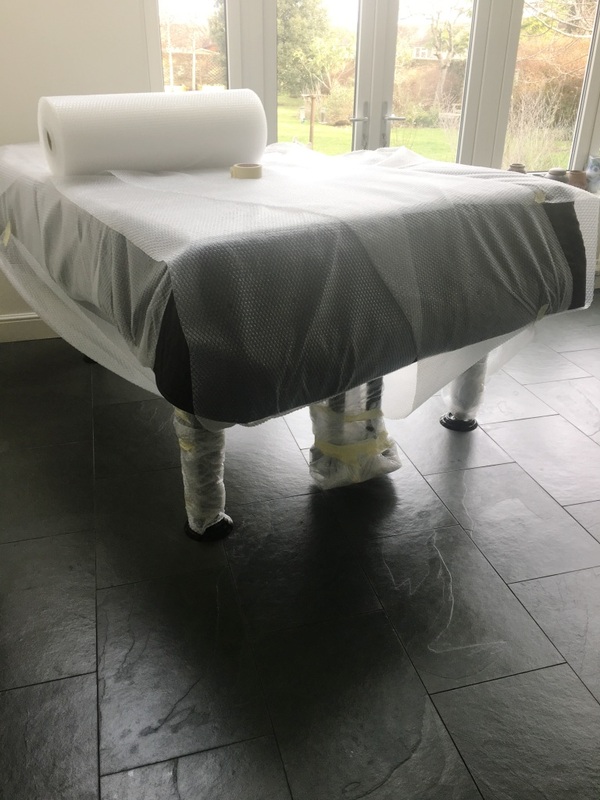 When I arrived on the appointed day, I discovered that the owner had gone to some lengths to pad the piano with bumble wrap mostly to prevent any airborne chemical or dust damage. 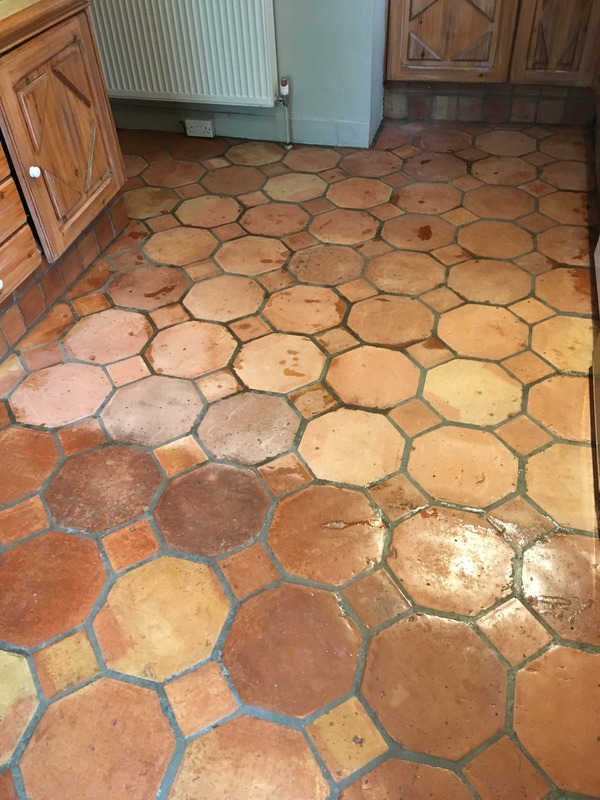 Working in sections I started applying Tile Doctor Remove and Go to the floor which is a powerful coatings remover that would strip what was left of the old sealer from the floor. The product is left on the Slate for about ten minutes before scrubbing it in with a rotary machine fitted with black pad. The machine is run at slow speed to minimise splashing and then the slurry is rinsed off the tiles with water and a wet vacuum. I inspected the floor at this point to ensure the process was having the right effect and it became evident that there was no integrity in the grouting which was crumbling. This was a major problem and it became clear that the only way to resolve it would be to remove and replace all the grout. Over the next couple of days, I cut out all the existing grout with a special tool. 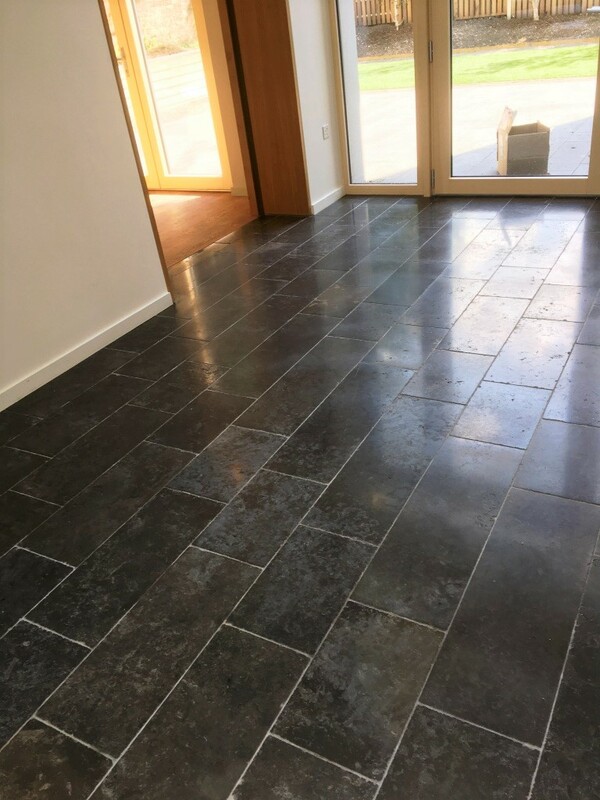 They were large format slate tiles however with most of the ground floor needing to be re-grouted it took some time to complete. Once all the grout was removed, I set about applying fresh grout using a colour that highlighted the Slate tiles better. Once the grout had dried, I was able to start applying a new sealer to the Slate tiles. 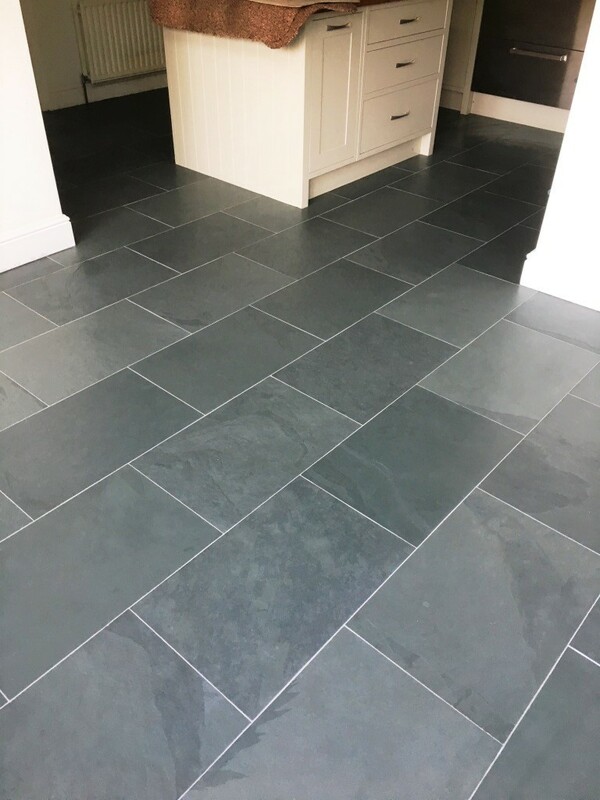 Slate responds well to Tile Doctor Colour Grow which is an impregnating sealer that protects the stone from within. It’s also a colour enhancing product that really brings out the best in natural stone such as Slate. 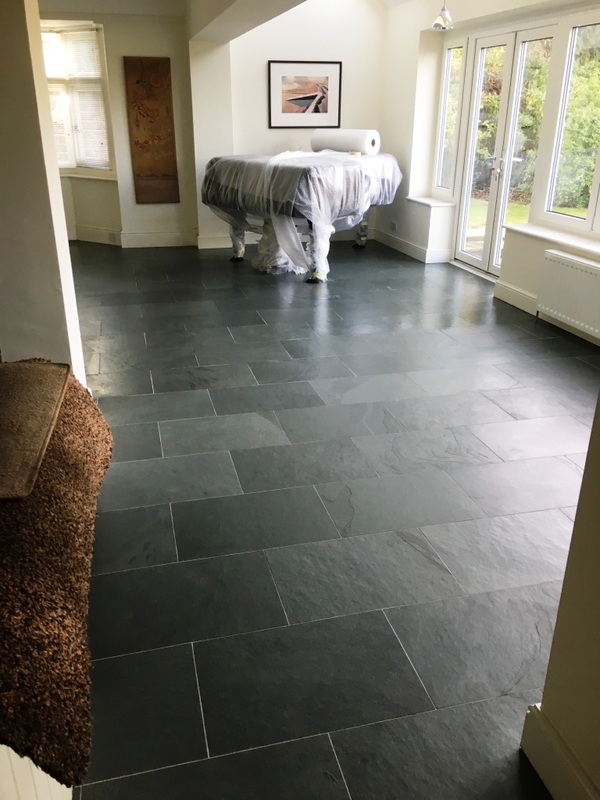 Two coats of Colour Grout were sufficient to seal the Slate tiles and I think you will agree the stone floor has come back to life and become a fine setting for the Baby Grand Piano. 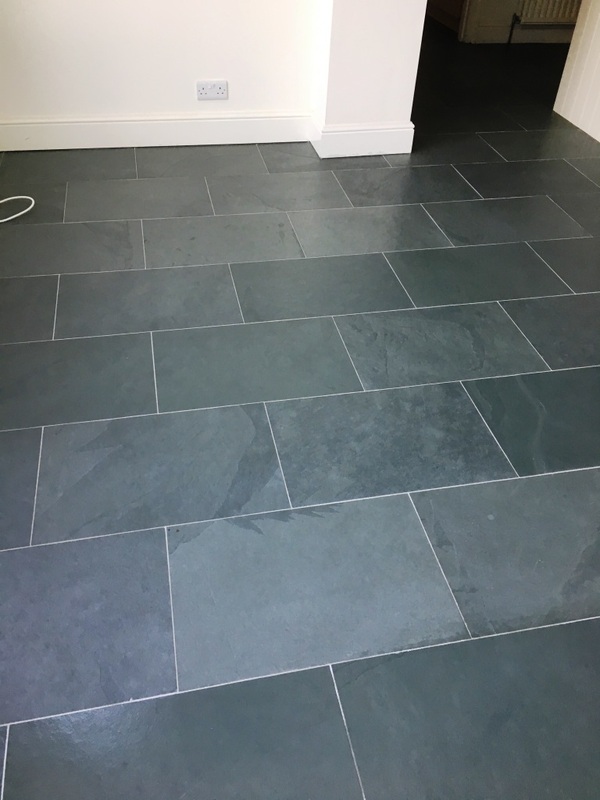 Before leaving my very happy customer to the enjoy, I left her with customer with a complimentary bottle of Tile Doctor Stone Soap, a neutral and highly reliable cleaner for natural stone floors such as Slate. This will assist her in maintaining the appearance and condition of the tiles going forward. Another satisfied customer! Pictured below is an old Quarry tiled floor in the Kitchen of a house in the small farming village of Goostrey. I went over to survey the floor at the request of the owner who felt it was overdue a deep clean and seal. It was a classic floor that suited the kitchen and its Aga well however I’m sure it could tell a story. 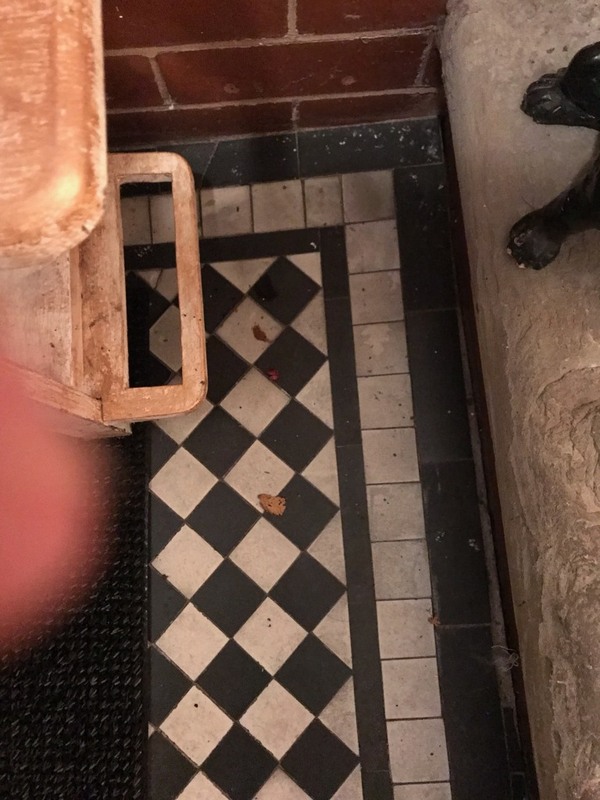 There were patches of white efflorescent salts in front of the Aga itself and another section of floor where the tiles were a slightly darker shade. I assume some replacements were made in this section at some point in the past. 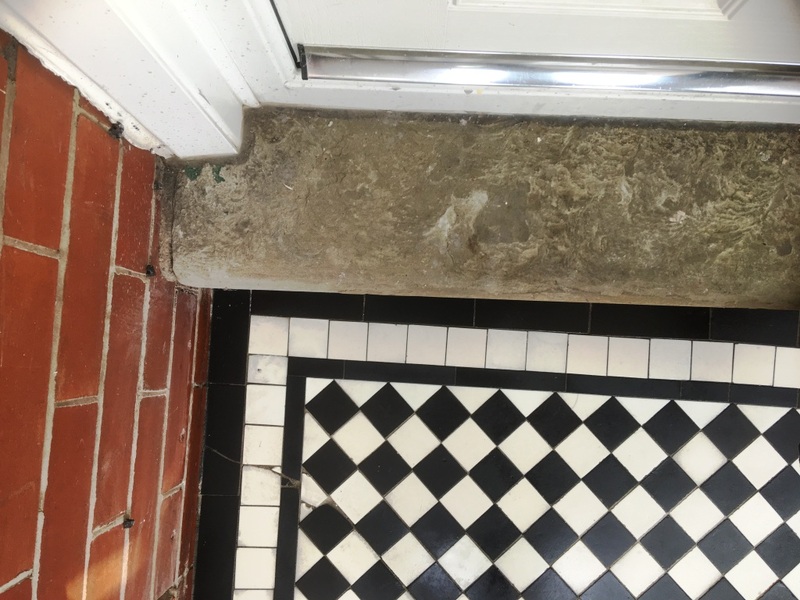 Efflorescence occurs when damp in the subfloor rises through the tiles depositing white alkaline salts on the surface of the tile as the moisture evaporates. This is quite a common problem in older properties where no damp proof membrane is present under the floor and more so where you have a warm Aga heating the space and encouraging evaporation. As per usual the floor was survey noting all the points above and then I carried out a test clean on a small part of the floor. This helps me understand what products and process I need to follow in order to renovate the floor and thereby product an accurate quote for the work. This went well and the owner was happy for us to process so we agreed a date to start the work which would take two days. To clean the floor and strip off any remaining sealer I first created a strong dilution of Tile Doctor Remove and Go which was sprayed onto the tiles and then left to soak in. Remove and go is a powerful stripper and cleaner that is safe to use on tile and stone. The product is designed to loosen paint stains, adhesives and many types of urethane and wax coatings so they can be easily removed. 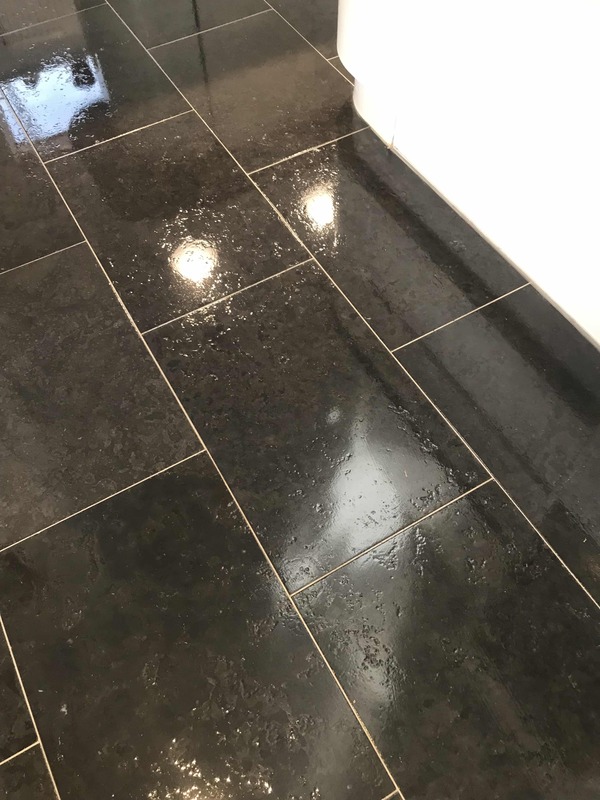 After thirty minutes the solution was scrubbed into the tile and grout using a weighted rotary machine fitted with a black scrubbing pad and running at a slow speed. The resulting cleaning slurry was rinsed off with water and then extracted from the floor using a wet vacuum. I repeated this process until I was confident the tiles were clean and free of old sealer. 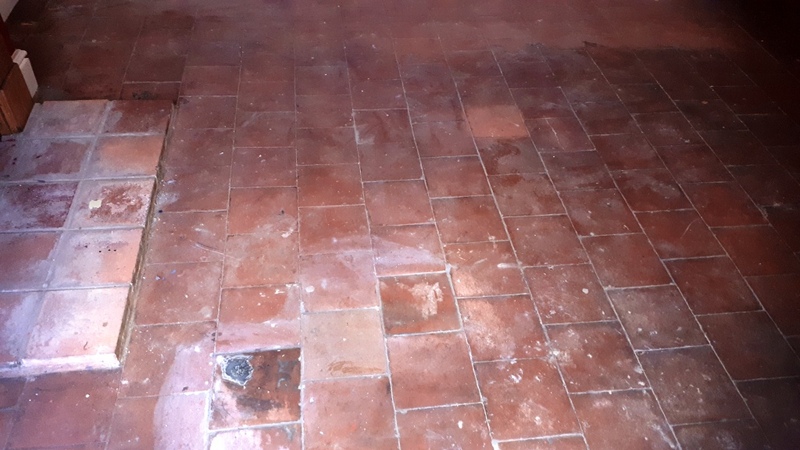 The next step was to neutralise the alkaline salts in the floor which could later lead to efflorescence by treating it to an acid wash using Tile Doctor Acid Gel. The gel was left to soak in for five minutes before washing it off using the wet vacuum to get the floor as dry as possible. The floor was left to dry out overnight and the next morning I returned to the property and took some readings from the floor with a damp meter. It’s important to check the floor is dry before sealing because any excess moisture can cloud the sealer and prevent it from doing its job properly. 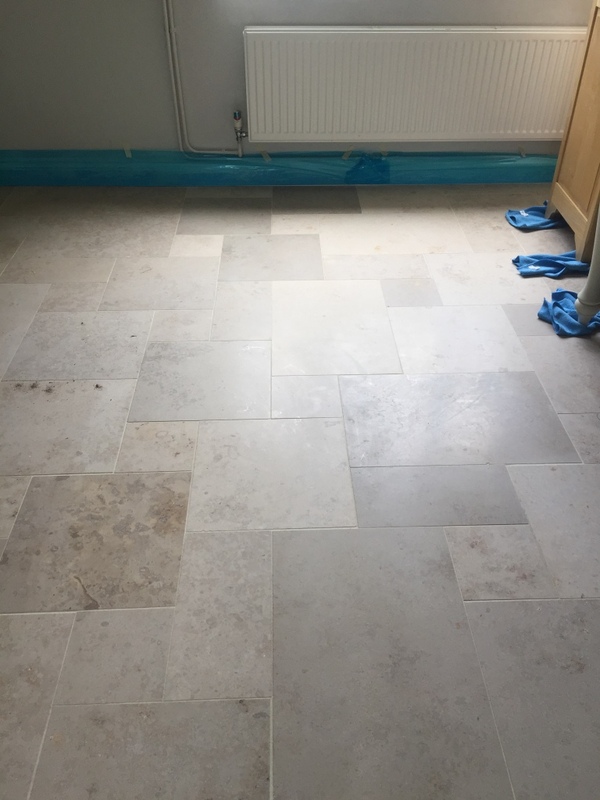 The customer was very impressed with our work and asked if we can come back later to remove the white tiles in front of the Aga and replace with Quarry tiles to match the rest of the floor. 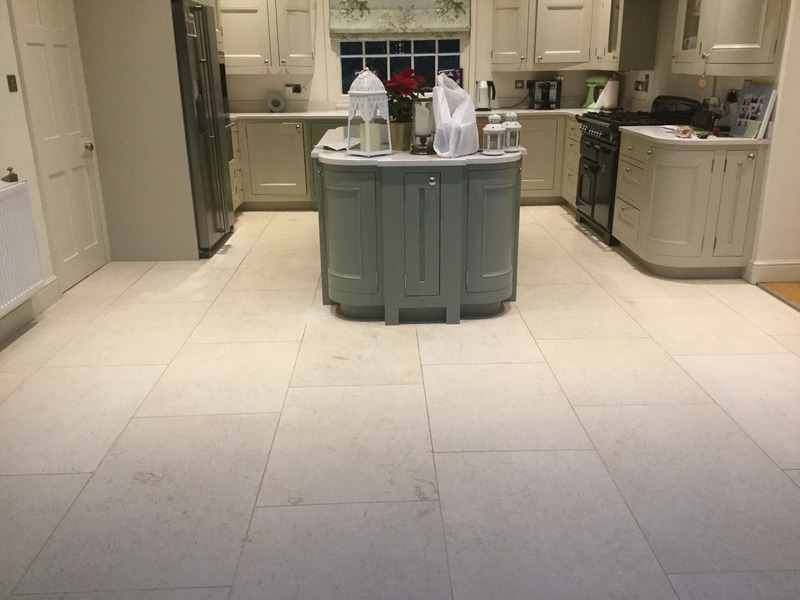 I was asked to visit a house in Boxworth Cambridge to survey a large Limestone tiled kitchen, dining room, utility and hallway. The customer was not happy with the finish of the tiles and wanted it to have more lustre. Additionally, the floor had suffered some damage in the dining room where the floor had been scratched by table and chair legs. Boxworth is a small village of around 100 houses, this property being one of the larger ones. The village lies around eight miles to the north west of Cambridge. I examined the floor and discussed with the client the process we would use. 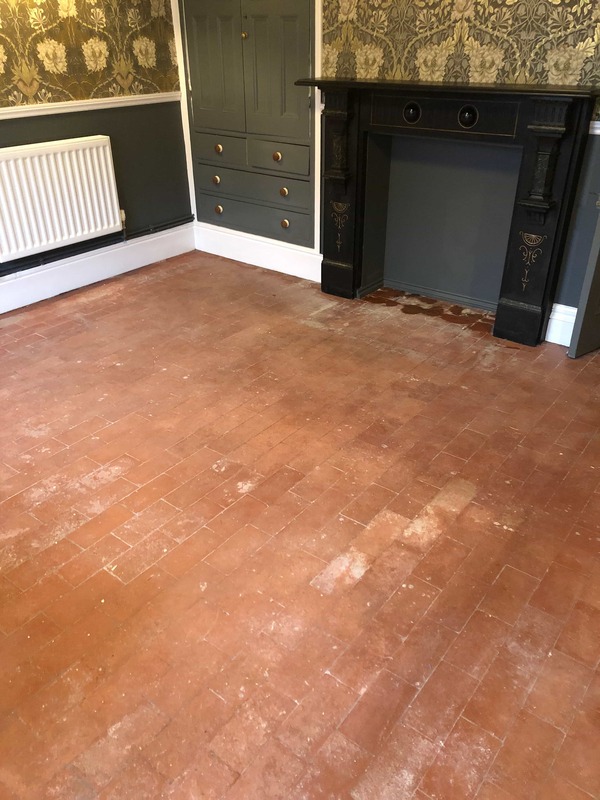 Although not looking their best, I could see that the Limestone tiles contained a variety of natural colour shades which with the right treatment could be made to really come to life. I presented a quote which they were happy to accept. My first job was the protect all the surrounding areas from splashing during the cleaning process. To do this I removed the kickboards from underneath some of the kitchen units, elsewhere was covered with a blue protective film. 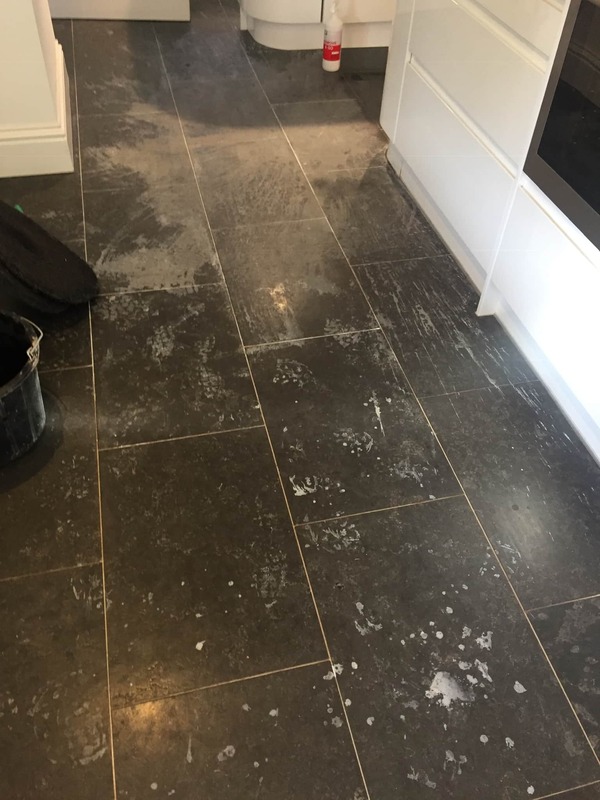 To start the cleaning, I first applied a dilution of Tile Doctor Remove and Go to the floor and then worked it in using a black scrubbing pad fitted to a rotary machine. I also scrubbed the grout by hand as the pads can struggle to reach into the recessed grout line. After rinsing the floor with water, the soiled solution was then extracted off the floor using a wet vacuum. I followed up this process with the application of a set of Diamond burnishing pads starting with the coarse 400-grit pad, then medium 800-grit pad, fine 1500-grit pad and finishing with the extra fine 3000-grit pad. The pads are fitted to a rotary floor buffer and are run over each tile using water for lubrication. All the slurry produced by the cleaning pads is removed away using our truck mounted hot water extraction machine to cause minimum mess to the client. The floor was left to dry off overnight and I would return the next day to finish the polishing process. 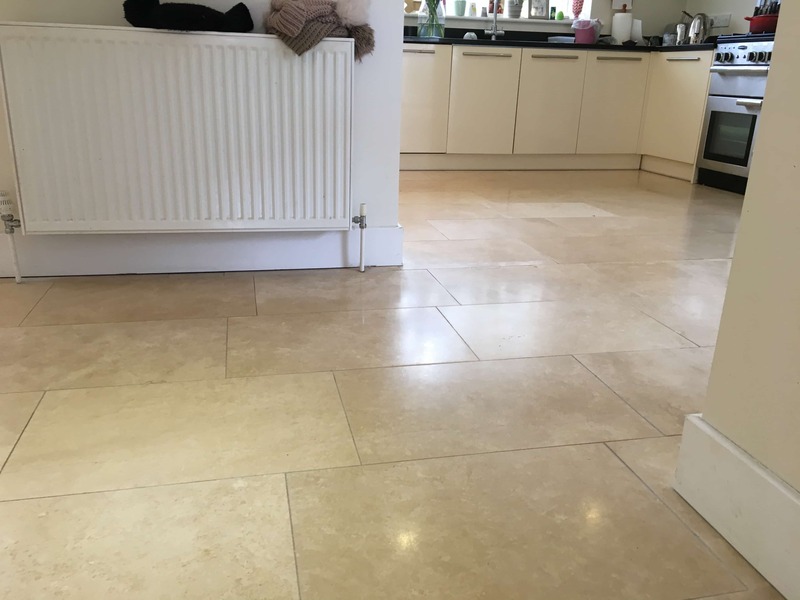 On the following day, we checked the floor was completely dry and then using a white buffing pad ground Tile Doctor Shine Powder into the Limestone floor. The powder builds up a deep and durable polish on the tiles leaving a deep and resilient lustre. 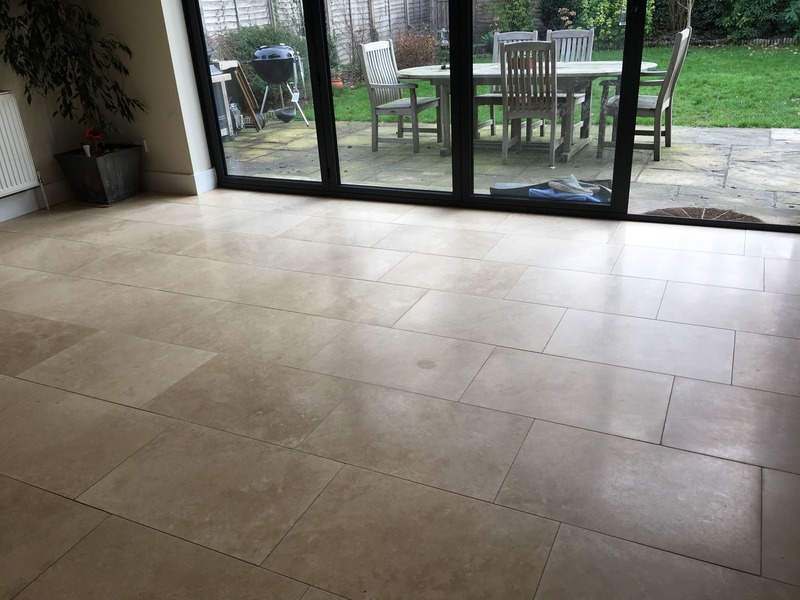 To further protect the stone and enhance the natural colours in the Limestone a couple of coats of Tile Doctor Colour Grow impregnating sealer were applied followed by a light buff with a red pad. The sealant is an impregnator that seeps into the pores of the stone protecting it from within and intensifying the natural colours in the stone. When finished the floor looked great. We had managed to remove the scratches from the dining area and the floor now had the lustre that the client had been hoping for. 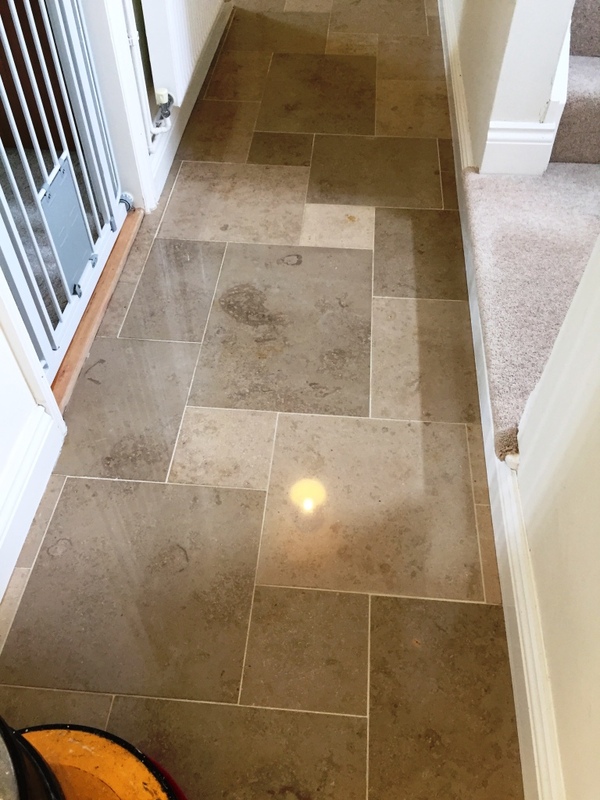 My client contacted me regarding their quarry tiled floor which hadn’t been in a good condition for some time. A recent flood in the house, caused by a ruptured pipe in an upstairs boiler had only added to the problem. As you can see from the before pictures, the floor was in a sorry state. On the plus side the flood had led to an insurance claim which would cover the cost of the restoration. 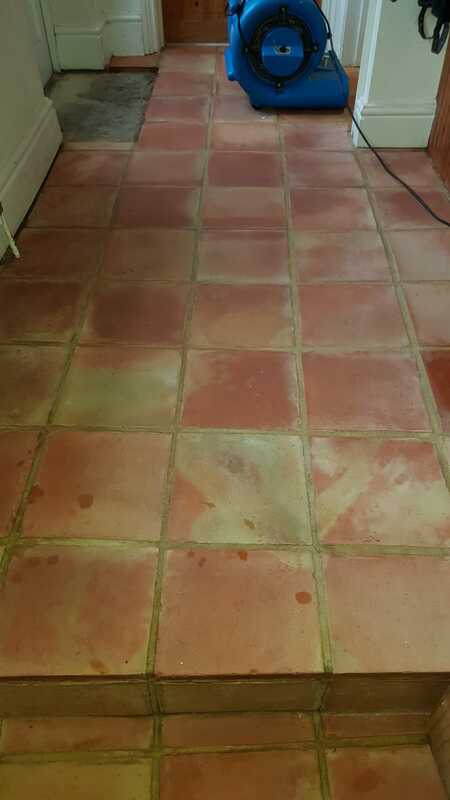 I visited the property and did a test clean on a section of Quarry tiles which came up well. The client was happy the result and agreed to go ahead, my quote was agreed, and the job booked in. The property was in Bearwood which is in the southern part of the Birmingham suburb of Smethwick. 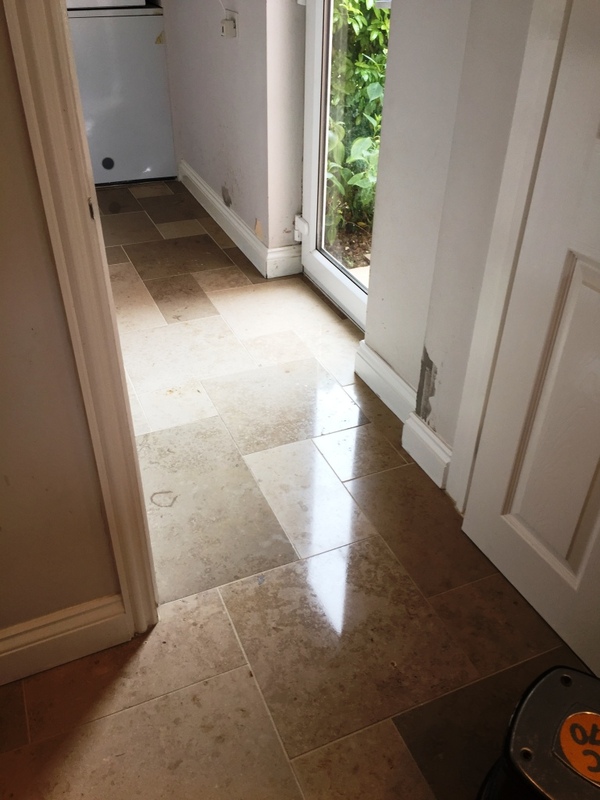 The client also needed some Quarry tiles replacing due to them being broken and damaged. 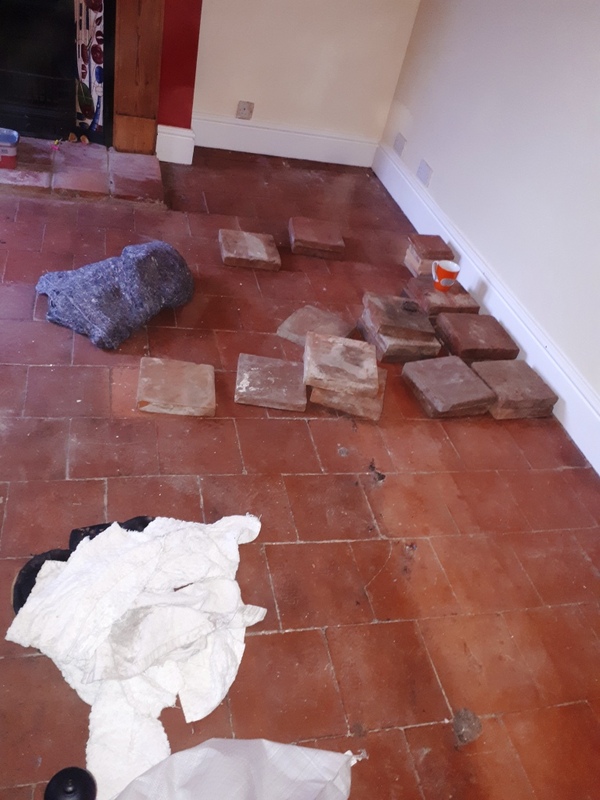 So before returning my first task was to source some replacement quarry tiles that would be a good match for the existing. 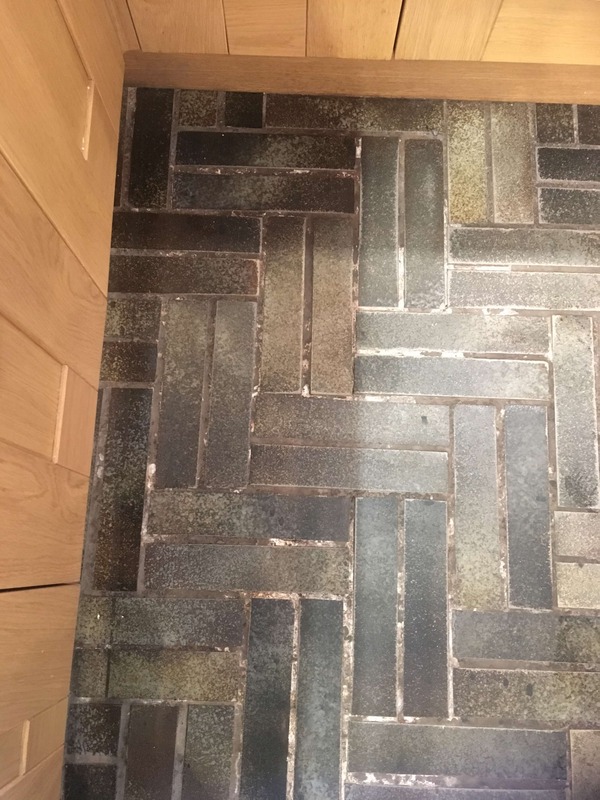 Fortunately Quarry tiles are still popular and I was able to find a set of reclaimed tiles that would make good replacements. 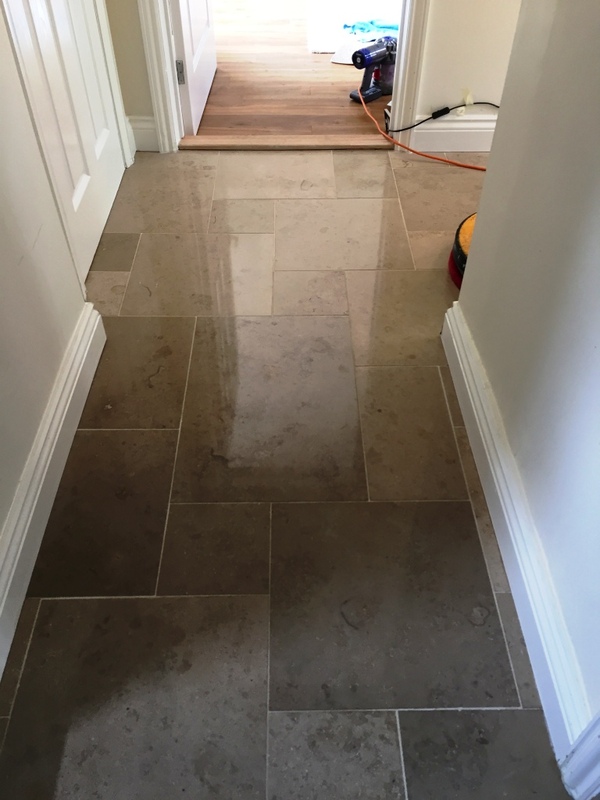 I was able to get the replacements delivered in time for the job starting which was just as well as my first task would be to repair the floor. 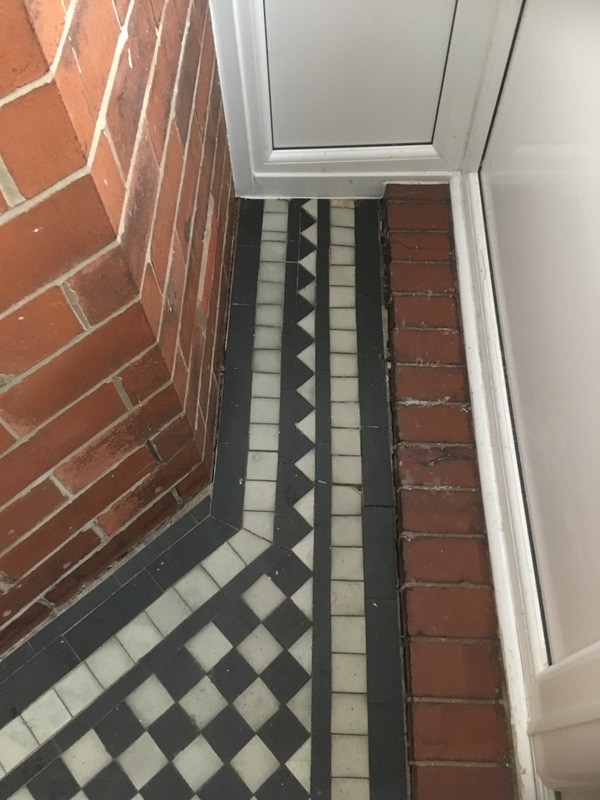 Fitting the replacements was tricky work as some of the tiles were up to two inches thick and came in various sizes and so had to be cut to size with a wet tile cutter. 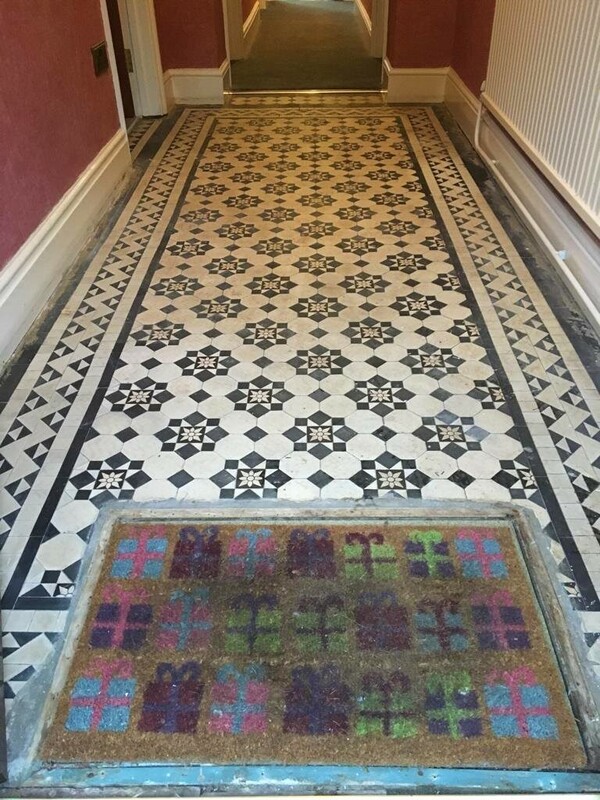 The tiles were a good match though and they were set in place. Later that day I was able to grout them in using a matching grout along with some other areas that needed re-grouting. By the end of the first day the floor was already looking much improved. The next day the floor was cleaned with a strong solution of Tile Doctor Pro-Clean. The solution is left on the tiles to dwell for about ten minutes so it can start to soak into the deep-seated dirt and break it down. The tiles were then scrubbed with a black pad fitted to a weighted rotary machine. The grout was also cleaned at this point using more Pro-Clean and a hand-help scrubbing brush. There was also a fireplace hearth that needed cleaned, this also had to be cleaned by hand as the machine was too large. The floor was then rinsed with water and the resultant slurry extracted with a wet vacuum. The last part of the cleaning process was to give the tiles and acid-wash using a dilution of Tile Doctor Grout Clean-Up. 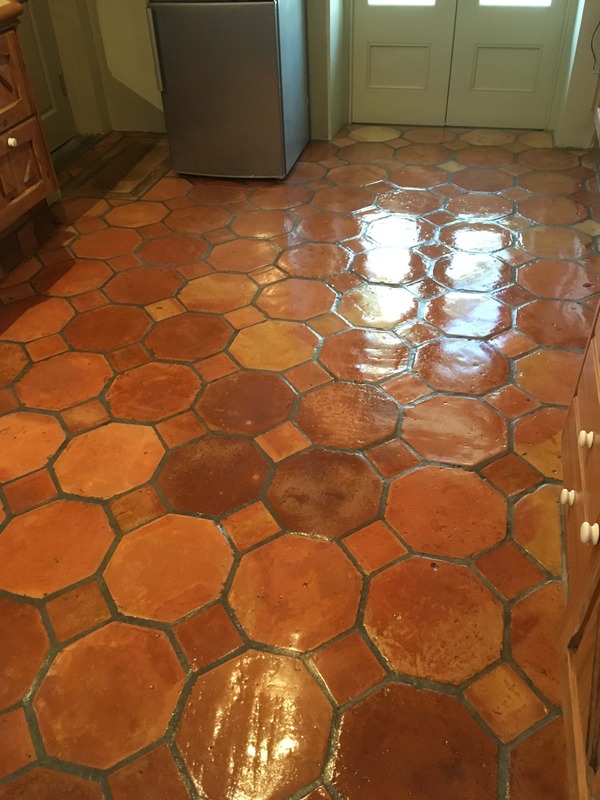 This is an acidic product that can remove mineral staining and will also counter any alkaline salt deposits in the pores of the tile that could surface as the floor dries later. The floor was rinsed again and allowed to dry out for two days before I returned. On the final day I first confirmed the Quarry tiles had dried out were ready for sealing. 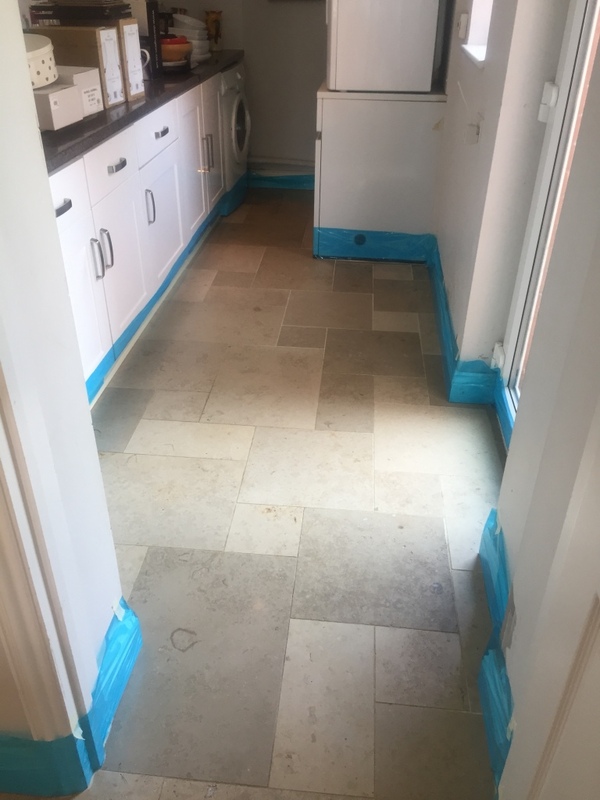 I then sealed the tiles using Tile Doctor Colour Grow which is a fully breathable sealer that would protect whilst allowing moisture in the floor to rise through the tile. This sealer will also enhance the strong natural colour of the quarry tiles. The tiles were quite porous so four coats of sealer were needed, then after drying the floor was buffed with a white pad. The work transformed the floor and my customer was over the moon with the end result. For after-care I left the customer with a complimentary bottle of Tile Doctor Neutral Tile Cleaner. This is a pH neutral product that is safe to use on sealed surfaces and won’t prematurely erode the sealer. 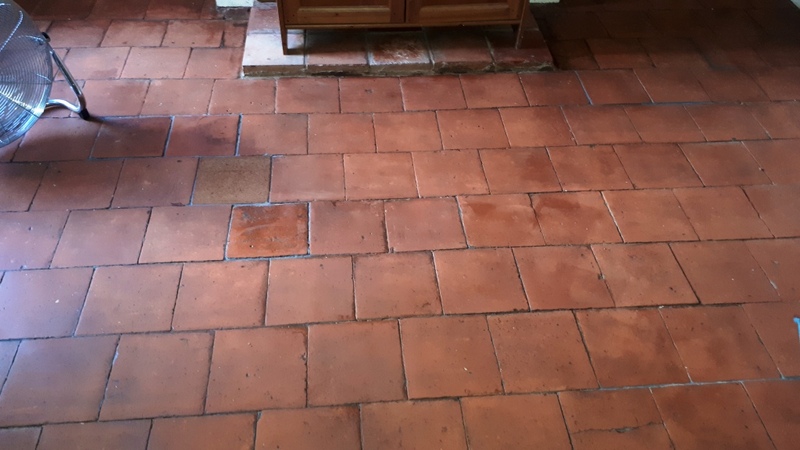 This Terracotta tiled floor in Middlesex had not been cleaned and re-sealed in twenty years. Deciding it was overdue a renovation the client asked us to come over and have a look at the floor and see what we could do to restore it to its’ former self. The property was in the heart of the town of Teddington, which is set on the north bank of the River Thames, with some lovely up market shops, restaurants and cafes. The floor was indeed in need of some attention, this type of floor does need a deep clean from time to time to keep it looking good and twenty years is far too long. The terracotta had previously had a varnish applied to protect it which is not something we recommend as its easily scratched. I discussed with the client the work required and we carried out a test to show them how effective the clean would be. Satisfied that we could get a good result, they were happy to go ahead with our quote and we booked in the work to be done a few weeks later. It’s not unusual for customers to want to get a quote over the phone however there are so many factors that can affect the price we always prefer out a site survey first. That way we can ensure we give the client the best advice an accurate idea of the costs involved. 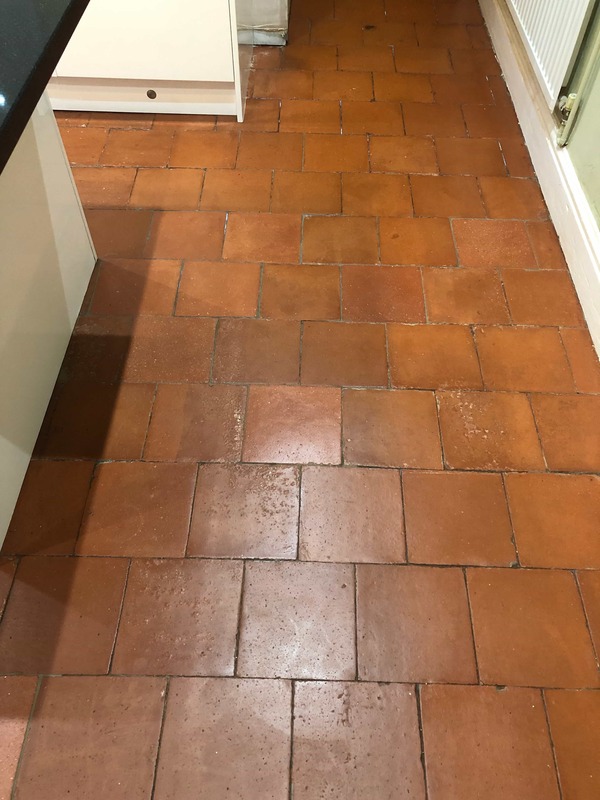 Using a combination of Tile Doctor Remove and Go combined with Pro-Clean, we managed to break through the varnish and remove the soiling within the stone. This combination creates a powerful stripper/cleaner that can simultaneously remove coatings and deep clean. 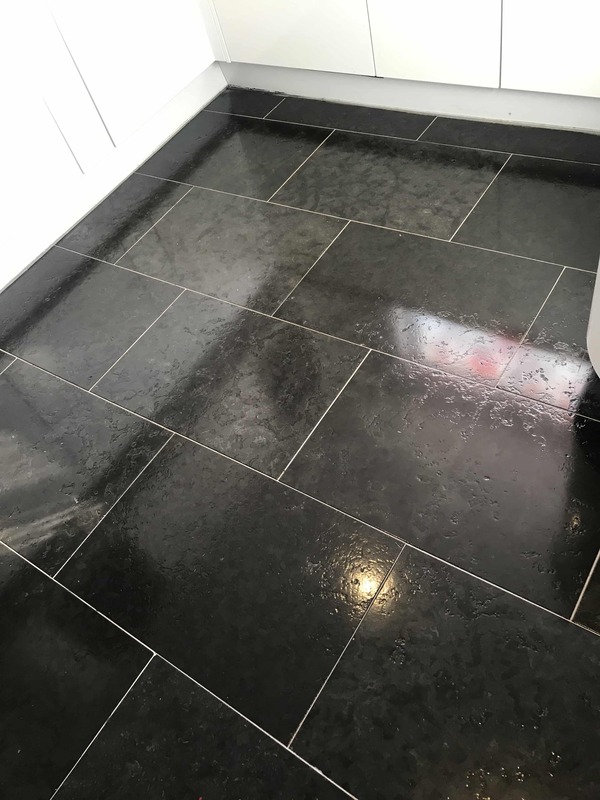 It’s best to leave the product to dwell on the tile and grout for ten minutes before scrubbing it with a rotary floor buffer fitted with a black scrubbing pad. A spinner machine was then used to flush the tiles through with warm water whilst simultaneously extracting all the soil and product residues. It’s important to fully rinse the floor clean as anything left on the tile can to upset a new sealer. Once we were happy that all the residue had been removed and the floor was as clean as it could be, we left the floor to dry out fully overnight. 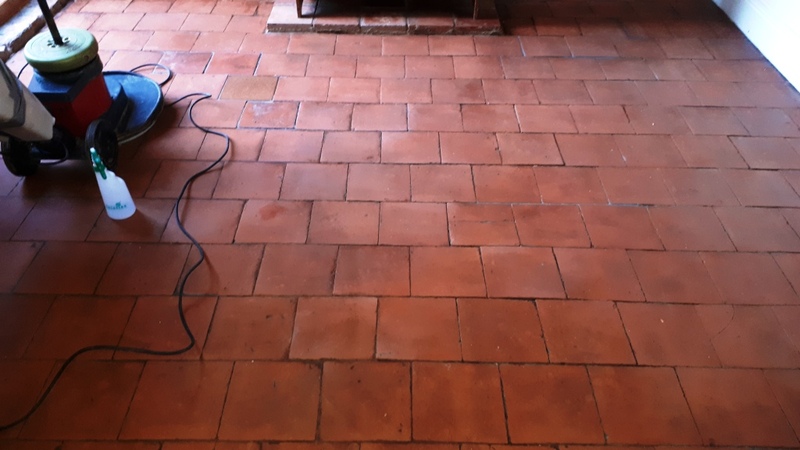 Returning the next day, the first task was to check the Terracotta tiles were dry with a moisture meter. I was satisfied with the reading and so was able go straight ahead with the sealing process. 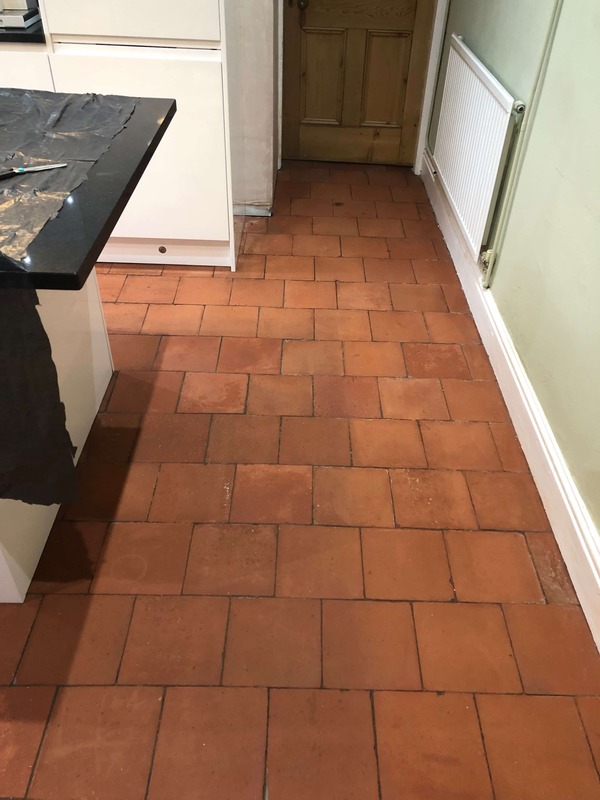 The best sealer I find for Terracotta is Tile Doctor Seal and Go which adds a very durable subtle sheen finish that make the floor much easier to clean going forward. As you can see from the pictures, the colours were greatly improved, and the lustre restored. 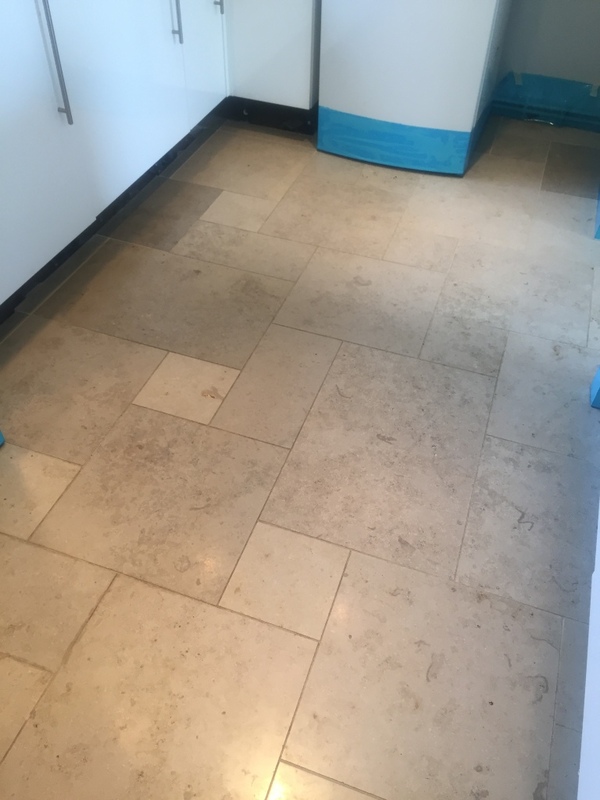 The client was over the moon with the result, they couldn’t believe how dirty the floor had been, but they were happy they would now be able to keep it clean. For aftercare I recommended they use Tile Doctor Neutral Tile Cleaner. This is a lovely fresh smelling product that has a its’ pH neutral formula that’s designed for cleaning sealed floors. It’s sold in concentrated form so you only a small amount each time you clean the floor. 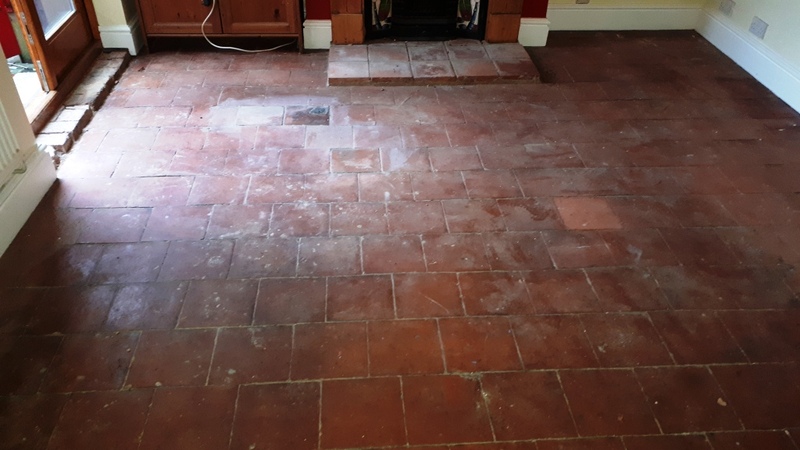 We received an unusual request from the owner of an old cottage in Bury who was unhappy with the state of the grouting in their Kitchen. 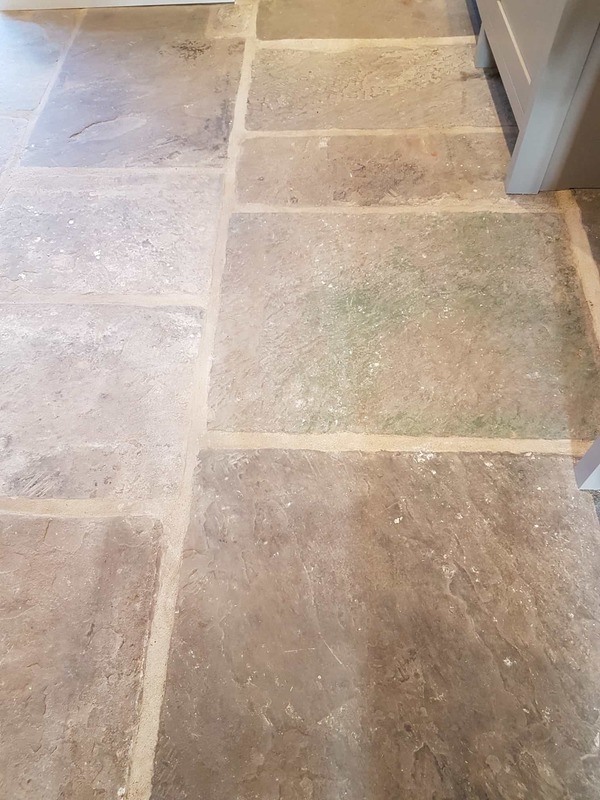 The customer advised us that the floor was very old and originally grouted with a lime mortar also that they had been in touch with several companies before contacting us including tilers and masons and none of them was interested. Intrigued I paid the customer a visit to survey the floor and work out the best way to renovate the grout. 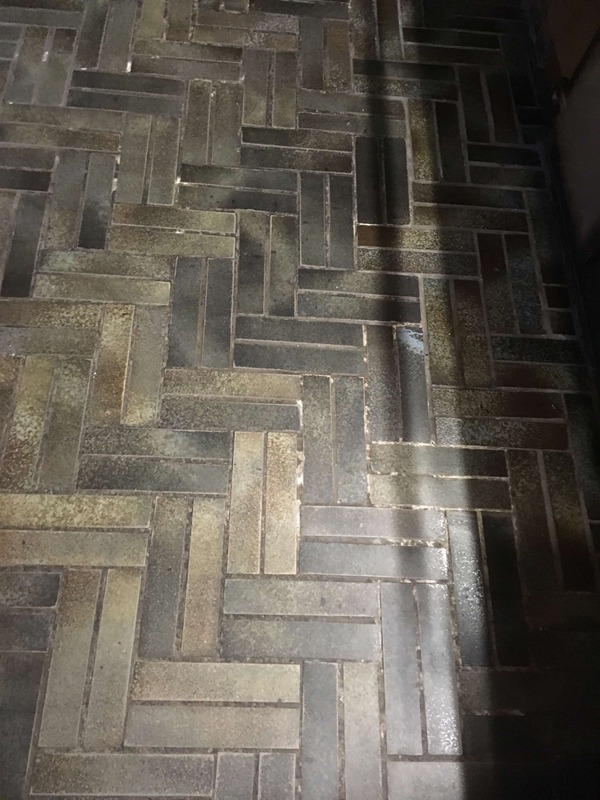 The cottage turned out to be three hundred years old and the owner wanted to keep the Quarry tiled floor which was laid in a Herringbone pattern and still in good condition as a period feature as it complemented the rustic look of the cottage. 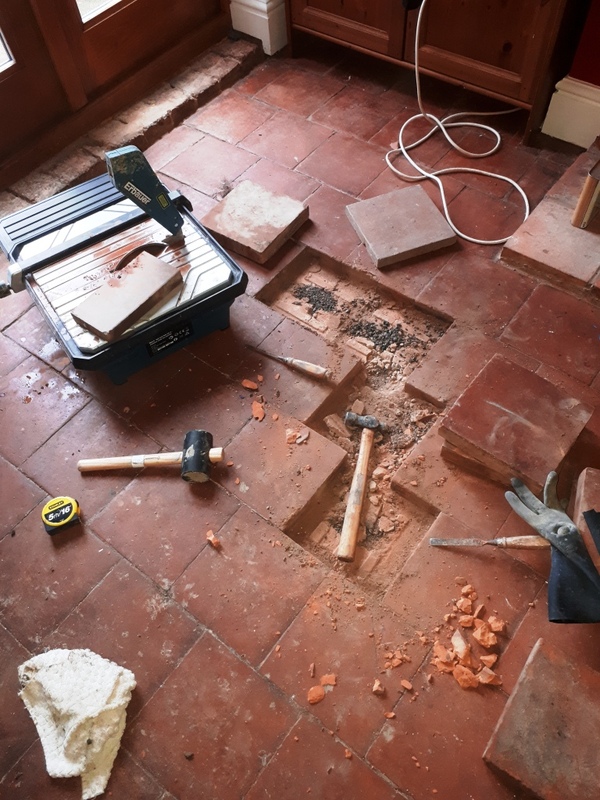 After testing the floor, I was able to confirm it was indeed Lime Mortar which was historically used on walls and natural stone floors until the 19th century when it was replaced by cement. The mortar was now grubby and had shrunk in places where it had then been topped up with conventual grout resulting in a patchy appearance. I felt simply cleaning the grout wouldn’t resolve the irregular look so my suggestion was to use a grout colourant that would sit on the surface of the grout and provide a uniform appearance. 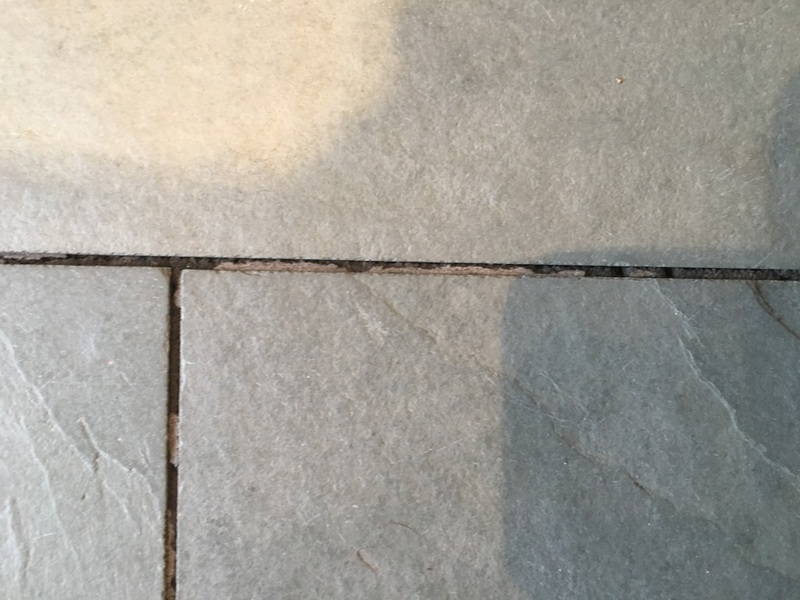 I must point out that the Grout Colourants used by Tile Doctor are not like grout pens you see on home make over shows, they are much more effective. Happy to go with my recommendation I set about preparing and cleaning the Quarry tile and mortar with a strong dilution of Tile Doctor Pro-Clean. This is sprayed onto the floor and then scrubbed in with a buffing machine fitted with a scrubbing pad. This action turns the cleaning solution into a slurry as the dirt is lifted out of the floor which is then rinsed off with water and extracted with a wet vacuum. 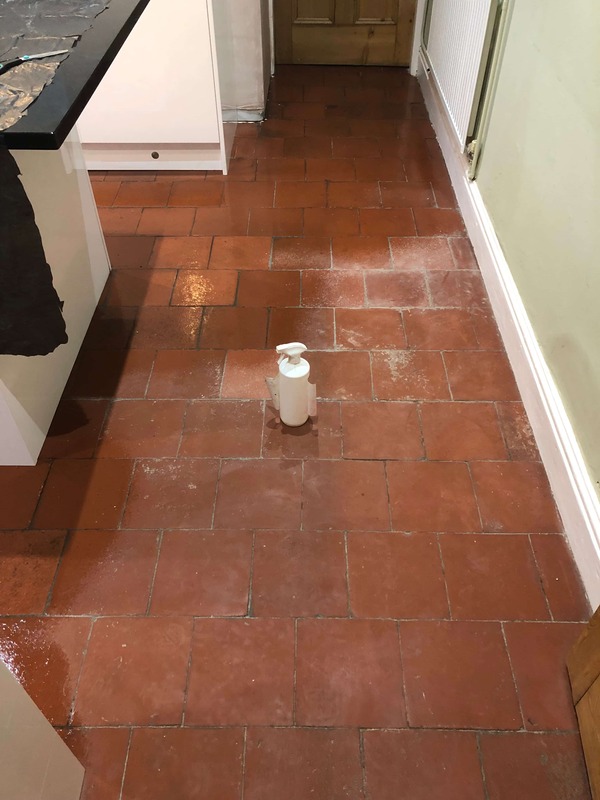 Tile Doctor do sell a Grout Colourant Pre-Treater product that has been especially designed for this purpose however it’s slightly acidic and so not something I would recommend for use on lime mortar. Once the floor had dried, I started with the grout colouring which is painted onto the surface with a small brush. 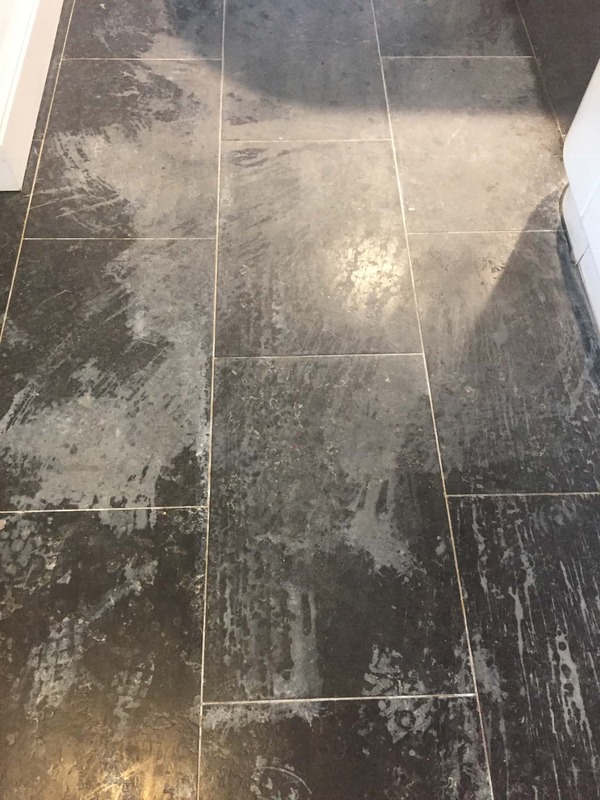 Two thin coats of natural grey colourant were applied and any excess that came into contact with the quarry tile was quickly wiped off with a cloth. The product dries within two hours but takes twenty-four hours to fully harden.